December | 2010 | Frank & Donnis Travel Blog "the more we see the more there is to see"
This weeks post is later than usual. We have exceeded our download allotment but can continue you operate at a greatly reduced speed. It has taken almost three hours to upload the text and photos. Goodness knows how long it will take to actually upload and publish this entry. Bad night last night. Woke about 2am and wide awake and in some discomfort. Rather than take painkillers I decided to try the age old remedy to fall asleep. ..TV! I went into the house and turned on the TV and sat back in the recliner. It sort of worked. I fell asleep. I woke. I fell asleep. I woke. At 5am I went back to my own bed. Donnis was sleeping so soundly I did not disturb her as I grunted in pain trying to get comfortable. She woke about 6am and put a shade in the window above the bed to keep out the sunlight shining in then she went inside the house so I could sleep on. Little did we know this would be the last sunlight we would see this week. We spent the best part of the morning setting up tarpaulins on one end of the WWWGO awning so now most of the rain which comes from that direction will be deflected. I also put an awning on the drivers side to shelter the fridge so it does not have to work so hard maintain temperature. I also put another shade tarpaulin over the door entrance so we will be able to leave the outer door open even when it is raining. 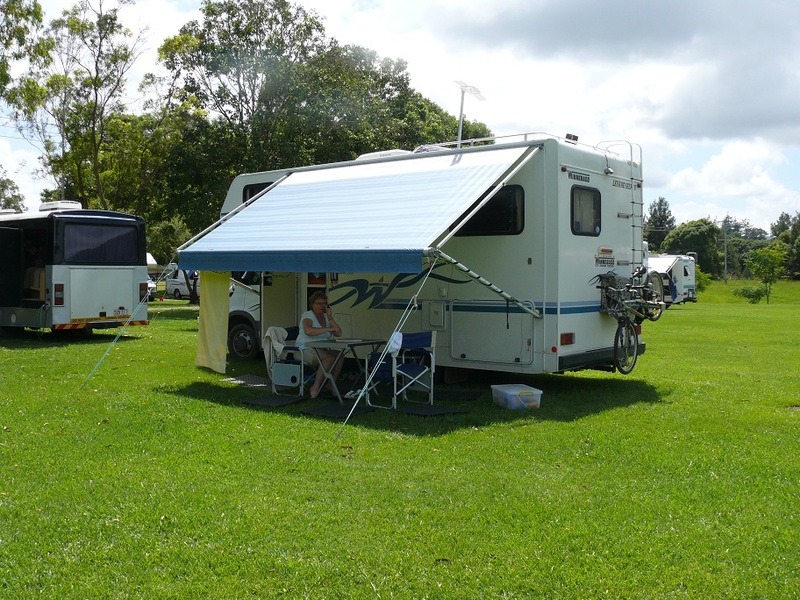 Our campsite with awnings and tarpaulins in place. We put all the rubber mats out in the sun to dry and allow the muddy ground underneath to dry out. Donnis removed our luggage from the car and we removed the bike from the rear of WWWGO. We are beginning to get our surroundings sorted out so we can be comfortable over the next three months. I also did a bit of research on Cooran, the nearest village, as Traveston is little more than a couple of buildings. The name Cooran is Aboriginal but I have two conflicting explanations as to its meaning. Guaran which means Tall Trees or Moreton Bay Bush. This explanation could be correct as the area has huge trees on the hillsides. However I can find no information on Moreton Bay Bush and I am sure it does not refer to Moreton Bay Figs as I have not seen any in the area. Guran the local fresh water lagoon where water bulbs and fresh water mussels were collected. The explanation is not clear if the lagoon was called Guran or the bulbs or mussels are called Guran. Take your pick. I like both explanations. It stayed sunny n hot all day and the ground had a chance to dry out. Weather forecast is for another nice day tomorrow and Wednesday perhaps even some of Thursday but then the rain comes back for the next several days, including Christmas Day. Hmmm. With all that expected rain I really need to think about putting something on top of the rubber mats (or even under the mats) so that mud and water does not squirt up through the holes when we walk on them. We took a walk around the property today and also took more photos of Mt.Cooran. We have seen Mt.Cooran in many moods, most of them wet n misty. It seems to me the mount has different moods and every day is different. During the walk I found a swarm of bees in a young tree on the hill above WWWGO. The property is generously populated with large trees like this one. 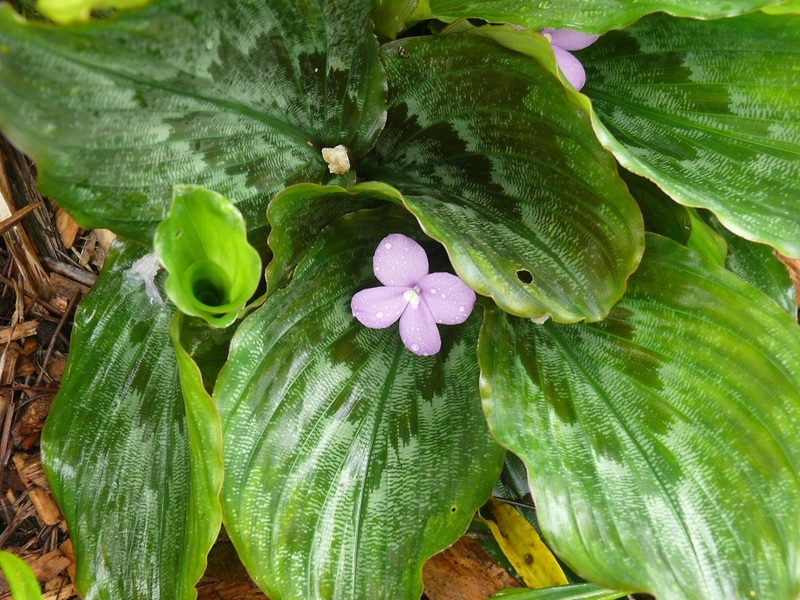 There are plenty of flowering plants in the gardens and bush around the property. I must try to wake a little earlier (for earlier read 4.30am) one day this week so I can take a photo of the sun rising beside the mount. The full moon rose this evening over the hill and treetops above us. The train line is only a few hundred metres away down the steep hill. This line has an electric service from Brisbane to Gympie several times a day. The line continues further north to Cairns so the Queenslander and freight trains also use the track. Depending on where we are during the day we have heard a train several times a day. Hmmm. It is nice to see the train service is still operating and as far north as Cairns. I cannot help thinking about all those distant western towns in Qld (and NSW for that matter) where the train services have been discontinued and the smaller towns are dying. 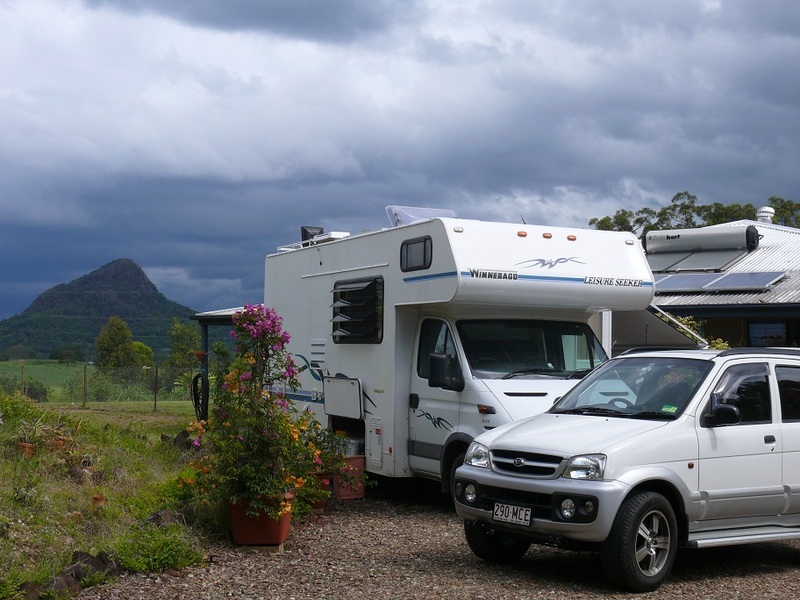 Travel is an eye opener especially when we see all the waste and or over servicing of the coastal fringe, especially the south east corner of Qld compared to the poor roads and closed railway lines further west and northwest. Another morning which saw both of us awake and out of bed at 5.30am. Morning work included emptying the cassette toilet. Emptying the grey water. This involved decanting it into 5 buckets and taking it away from the house and emptying it into the bush. Filling the fresh water tanks with…fresh water. In the process of walking around I encountered a whip thin, milk chocolate coloured, snake. My Google search tells me it is probably the Brown Tree Snake but they are usually active at night. I sure hope it was not one of the many Brown Snakes which are supposedly larger, faster, aggressive and venomous. Also bad tempered. In all cases I will leave them alone. After lunch we started to drive into Noosa but turned off just after Cooran for a 5.4klm drive to an unnamed lookout. The road was mostly uphill, gravel and steep. 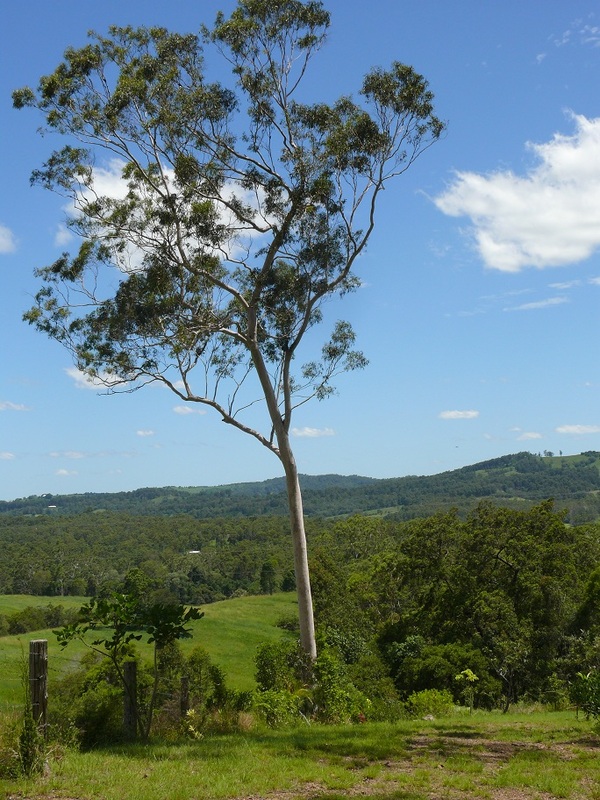 The view looking out across the valley towards Noosa and further south to Maroochydore is quite interesting. Before leaving I had experimented with the camera so I was able to zoom from 12x up to 48x and used Mt.Cooran as a test subject. So, here I was on a lookout higher than and closer to Mt.Cooran but unable to repeat the 48x zoom I was able to achieve in the house. Oh, well. Back to reading the instruction book again. After depositing a cheque at the bank and a little shopping we head over the Sue n Ken’s where I was very pleased to find my new mobile phone battery has arrived. Cost, including postage was $5.95. A local phone store in Maroochydore wanted $48 for a genuine replacement battery. Ken is a bit subdued this week as he has been diagnosed with shingles around his left eye area and he is obviously in discomfort. 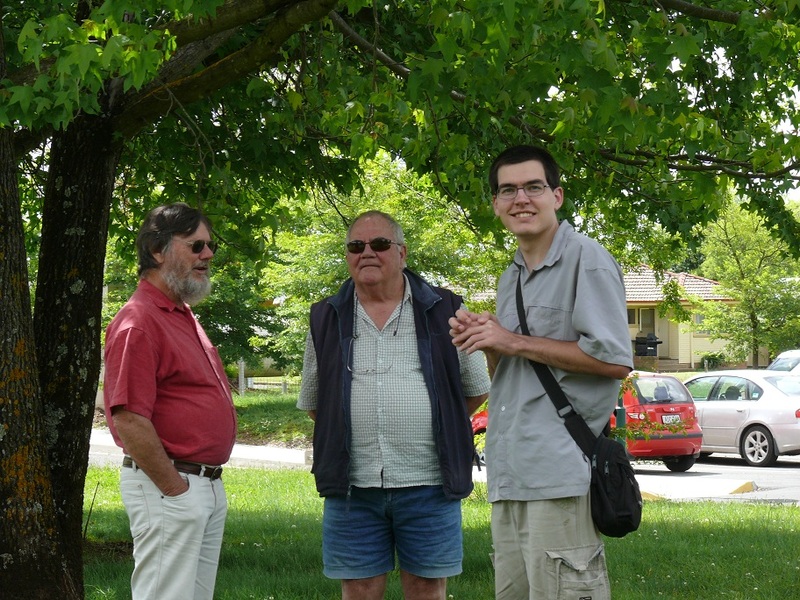 The four of us took a short walk along the river then we headed over to the Nursing Home to visit uncle Bill and have pizza with him as a sort of Christmas get together. Sister Eni (Sue) Bill, Donnis, Ken at the Nursing Home. Bill is pretty much confined to the Nursing Home as he can only walk around with the aid of a walking frame and most cars cannot take the frame. He is remarkably well informed about the outside world ( he reads all the newspapers and watches the news on TV) and knows all the latest gossip of what is going on in the Nursing Home. 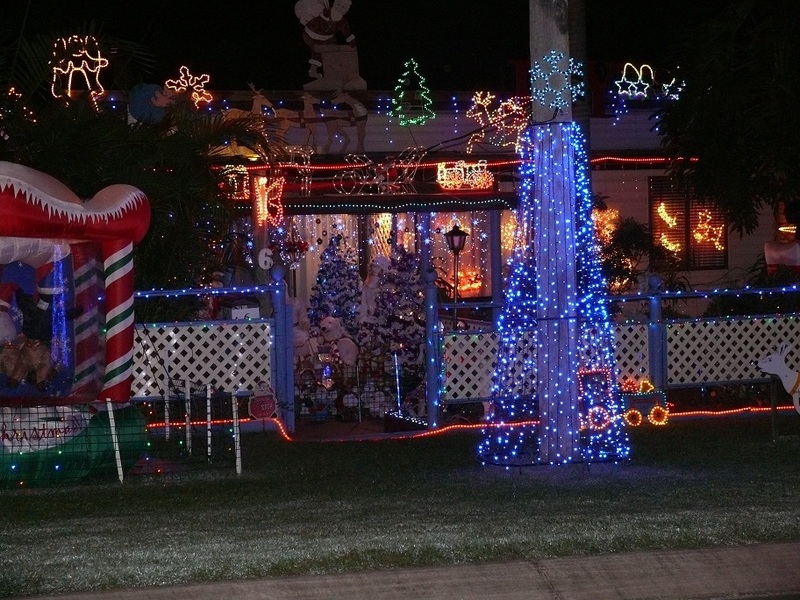 We left Noosa before 8.30pm and was just passing through Cooran when we noticed a couple of really large and impressive Christmas lights display in a side street. Impressive enough for Donnis to do a U-turn and go back for a closer look. Although I have seen Christmas lights in years past, I have never seen two houses, side by side with such a huge display of lights and animated Santa figures and Manger scenes. There was also a singing Bundy Bear and a singing, dancing Santa. Later, at home after a cup of tea I announced my ribs were not hurting and had not done so for a few hours but would take an anti-inflamatory tablet anyway. We both fell asleep watching a fluffy movie on TV. We went to bed and the Moon and Stars were shining so it looks as though tomorrow morning will be fine. Woke at 3.30am to the sound of light rain. I leapt out of bed to close the two overhead hatches. That was a mistake as my ribs are not intended for leaping out of bed while in recovery mode. I am typing this at 4,30 am while waiting for the pain to ease. Maybe there is something on TV. Today was a lay day. Perhaps that should more correctly be spelled LAZY Day. Apart from improving the awnings over WWWGO – to keep the rain out – taking garbage to the bins and putting kitchen scraps in the compost bin, we really did not do much at all. The rain was on and off. We are so over the rain as I suppose are most of the people on the eastern part of Australia. On the TV news last night an American tourist was interviewed and asked how he felt about the prospect of a wet Christmas Day. His reply was immediate and interesting. “Lovin it and it is preferable to a White Christmas”. Although the rain is annoying, it is not cold. The average temps are down but it is not cold. We still only need a sheet on the bed. Even when we have a blanket it gets kicked off the bed during the night. For dinner this evening we tried a new recipe in the pressure cooker. It was Sweet n Sour Pork Spare Ribs. It ended up tasting more like Chilli Spare Ribs as I changed the ingredients a bit. I somehow got confused with a Pork Spare Ribs with Sauerkraut recipe. I do not like sauerkraut as it contains too much vinegar. In fact anything with vinegar is too much for me. I can tolerate a little. As we did not have any sauerkraut I decided to cut up a heap of cabbage. Hmmm. The sweet n sour did not have cabbage in the recipe. Oh well. I tossed it on top of the other ingredients. What a stroke of accidental culinary genius! The ribs were slide off the bone tender. The cabbage was reduced to a sort of caramelised cabbage, absorbing all the brown sugar and chilli flavours. The meal was accompanied by mashed potato and a simple salad. Mmmm. Lovely! The complete meal was less than $10. Gosh only two more sleeps to Christmas. 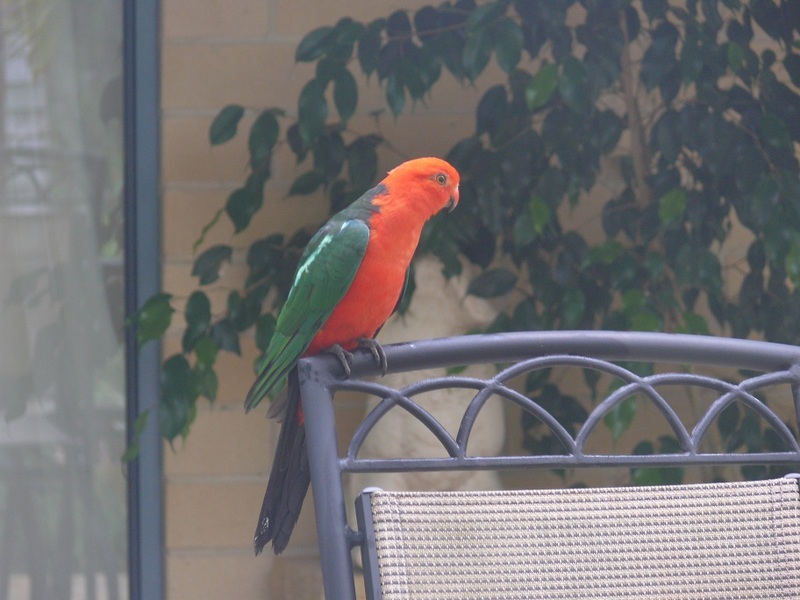 At breakfast this morning we were visited by a couple of magnificent King Parrots. The Kong parrot who came to visit. I am sure they were looking for something to eat as Guy told us he sometimes leaves bird seed on the barbecue. I think this plant is a member of the ginger family. of the many flowering plants around the property. Another flower using my new found skills on the Macro setting. Hmmm. Next time I will use the tripod. After the routine morning chores were done we set off to visit the Buderim Ginger Factory. The Buderim Ginger Factory is no longer at Buderim. 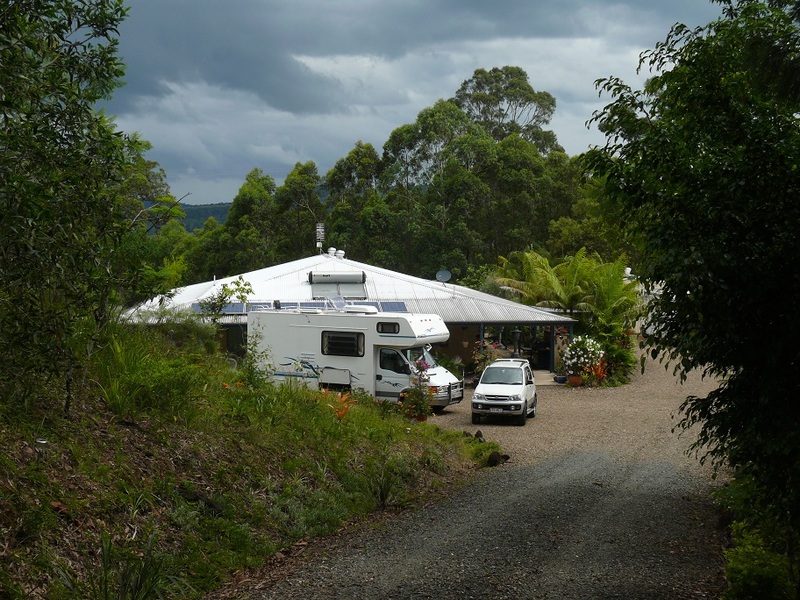 It is located at Yandina about 40 klms from Cooran. 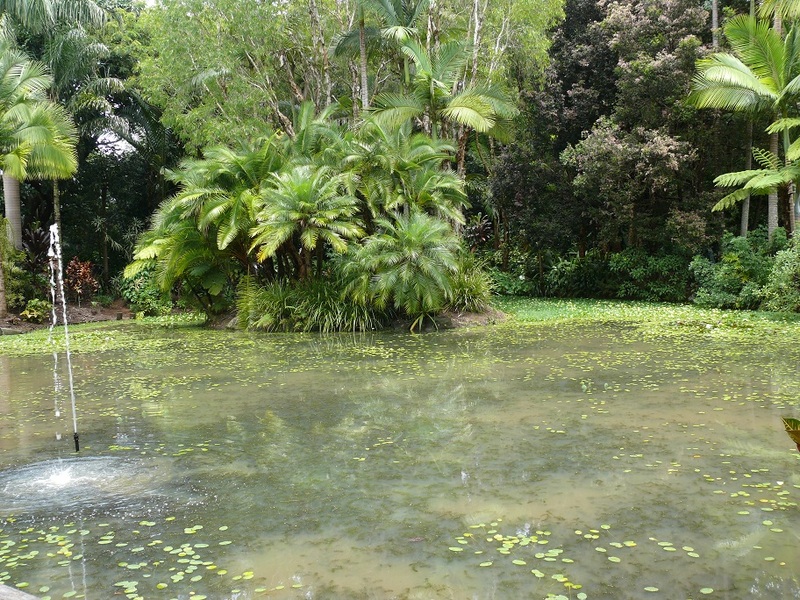 The lagoon at the Buderim Ginger Factory. We decided to drive as far as Pomona then turn off to the highway. Wow! Pomona is much more than the little village we drive to get to or come back from somewhere else. We promised ourselves to take some time out and walk through the village in the next week. Yandina Pub. Note the patrons on the verandah. and at the time of our visit was well endowed with drinkers. 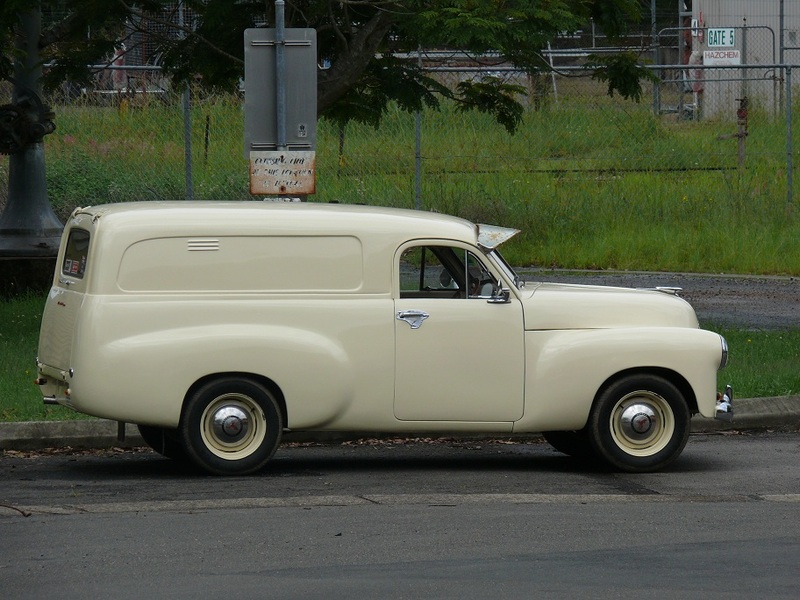 Rare FJ Panel Van - Across the street from Yandina Pub. The ginger factory labels itself as the best and largest ginger factory in the world. They make and sell and export anything ginger. All of which is grown locally. Way back in 1941 five local ginger farmers got together and discussed setting up a co-op to market their crops. Each kicked in five pounds to start off. A factory was eventually built at Buderim and quickly grew to the point that the premises were too small and transport was a bit of a problem. 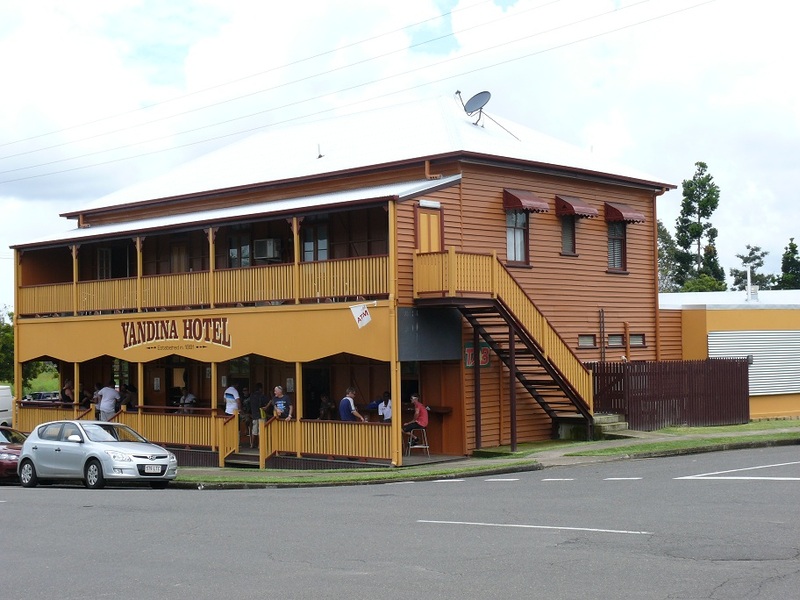 A new location was found at Yandina and as they say…the rest is history. It seems that during WWWII the supply of ginger from China was cut off so the local ginger was in demand here and overseas. The export earnings are so huge that overseas offices have been established in places such as UK, Germany, USA to name a few. 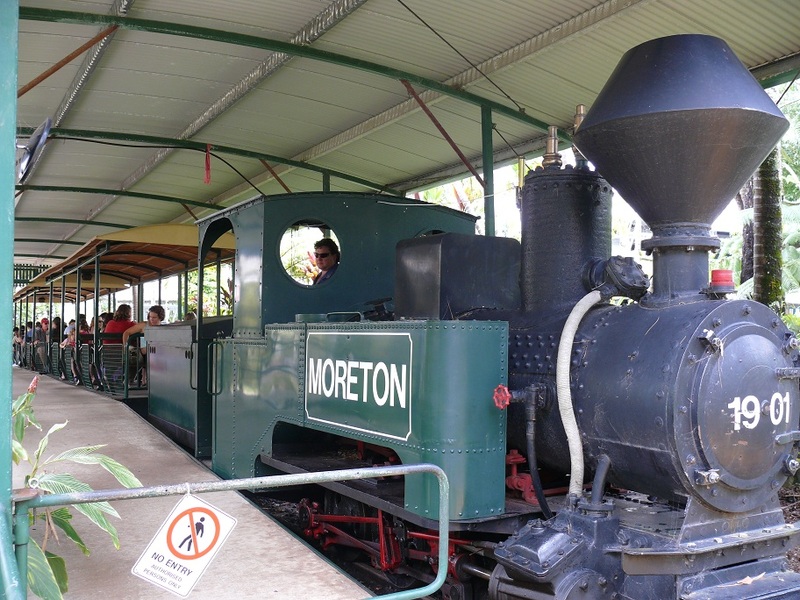 The 109 year old Ginger Train engine. through the grounds and looked at Gingerbread Man tour on a little boat. The train engine was built in 1901. Donnis on the Ginger train waiting for our tour to begin. 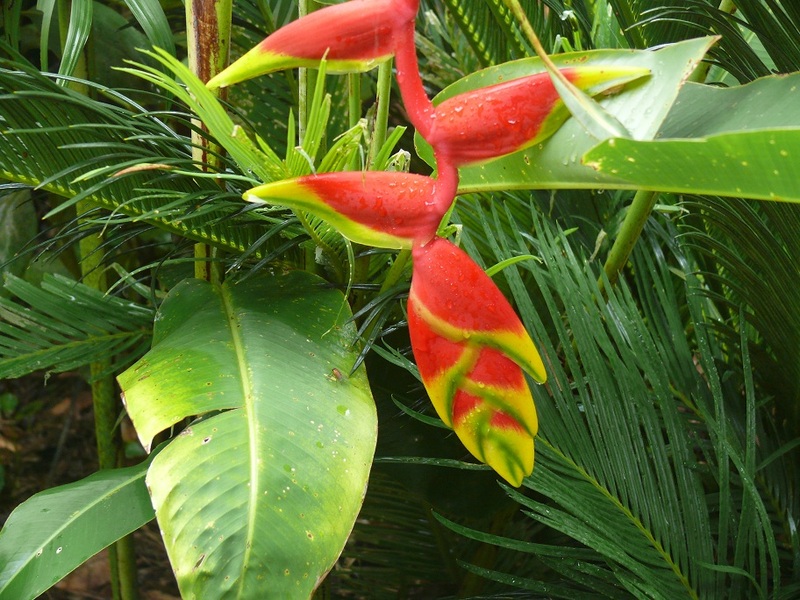 The factory is a tourist destination in its own right and has lots to see and do and has a walk through a rainforest with exotic plants including lots of ginger, all in flower. They also make 61 varieties of ice cream on the premises and have a little ice cream making room with a large window where you can watch the ice cream being made. All I got to see was the washing up. On arrival we had a coffee with a large ginger scone which included a giant dollop of ginger marmalade and whipped cream. The scones had just come out of the oven and were very hot. At $5.50 each it was a bargain. I was a bit hesitant about ginger scones but I am now a convert. Light rain started to fall but never bothered us. After the rain we walked across the road to a macadamia nut factory and had a look at their setup. They also had free tastings of their flavoured nuts. Lots of Japanese were there, buying up basket loads of macadamia nuts and associated gear. We also had lunch here but the menu was mainly nut free. Oh! They also make fancy chocolates here and have demonstrations in a little cooled room with a large window but today the demo was finished and all we saw was the completed chocolates such as orange slices dipped in chocolate and cherries dipped in chocolate. At $2.20 each they were a bit rich for us. Next door was a coffee factory with free tours and tastings but we forgot to visit. We can do that another day. We finished the day with a visit to the bank to query a rejected transfer of funds, then a visit to Centrelink then head back to Traveston to rest up while watching the news. Whew it was a long day doing tourist stuff. One more sleep for kids. Another heavy overcast and rainy day. Grrr! The water runs past our front door and when we step on the mats the mud squirts up through the holes. I have doubled the mats but we still get squirted. 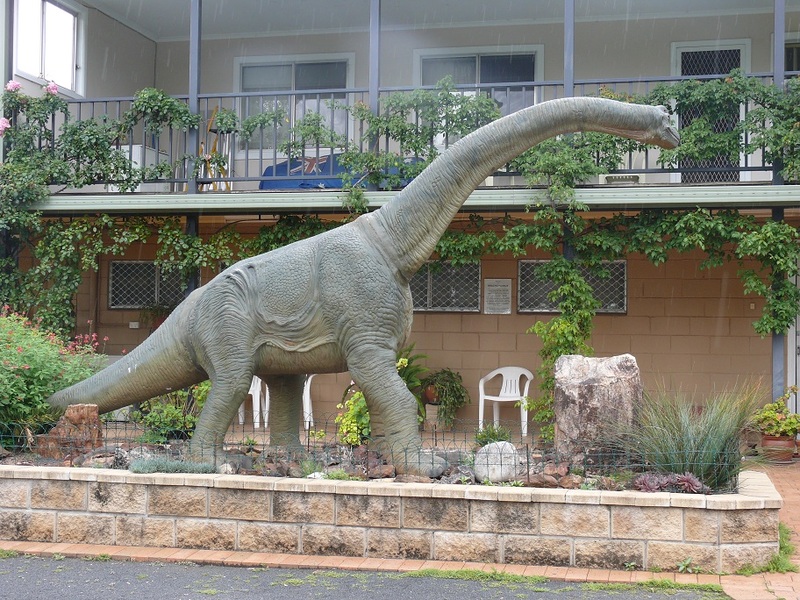 We went into Cooroy to look at a retirement village. Hmmm. Disappointing compared to Maleny. Almost the same price but older timber caravan park type buildings. Security gate no longer operates. It looks run down. The office was closed with a note on the door to call a mobile number. We called but got a recorded message. Bought a pie in Cooroy but nothing special. I will have to resume making my own. Weather forecast is for lots more rain for the next week. Since we left home on 19th September there has been more overcast and or wet days than fine days. There are flood warnings current for 15 Queensland Rivers. If the tropical low near Cairns changes to a cyclone and moves down the coast, more rivers will have flood warnings. Saturday 25th December. Christmas Day. Started the day well at 4.30am. A tropical low turned into a Tropical Cyclone, “TASHA” and crossed the coast a little below Cairns just after 5 am today. Although it was rated a Cat 1 cyclone there was still some wind damage but the rain and flooding caused the most damage. At Traveston it was a mainly overcast Christmas Day with a couple of patches of sunlight and light showers from time to time. Later in the day it started to rain and continued steadily until we went to bed very late at 11.30pm. We spent a quiet day together speaking with our children on the telephone. We went to a Church service at the Uniting Church in Pomona where I developed an uncomfortable bout of indigestion which became very uncomfortable and now included a headache. Some fizzy ginger ale, Enos and a couple of Panadol gave some relief, enough so I could fall asleep until lunchtime. Lunch was at Cybils on King, a restaurant in the village of Cooran. Cybils on King. A restaurant in the tiny village of Cooran. We met another couple who recently moved to the district. They run a publishing business from their property. There are some interesting old buildings in Cooran. One, little bigger than an outdoor toilet is used for a massage business. 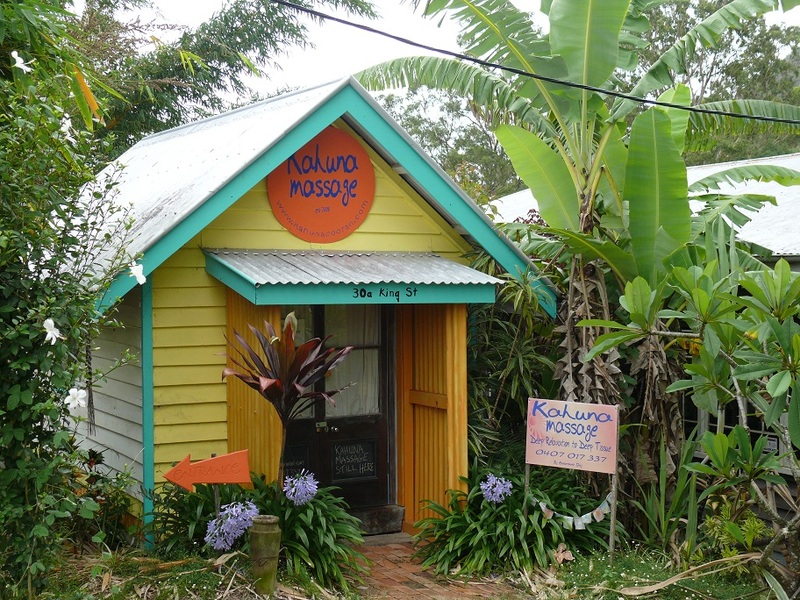 Quaint Ka Huna Massage building. After lunch I went to bed for a couple of hours sleep. Lunch was so good we only needed a light salad at 8pm followed by some plum pudding and custard. That was our day. There really is not much you can do on a wet Christmas Day. Listened to the constant rain for a few minutes before getting out of bed. At 5.30 a movement caught my eye. It was a good sized Kangaroo crossing the driveway. A smaller roo followed. All this constant rain reminds me of the 1982 Harrison Ford movie, Blade Runner. The film had a background of constant rain and damp. Our bedding and clothes no longer feel crisp but rather limp and damp. Spent the day snoozing or watching TV or in my case a combination of the two. Of course from time to time I got up walked outside and watched the rain. Despite all the constant rain we do feel blessed that we are all set up and WWWGO is dry and comfortable. We also have power, water and toilet facilities. Imagine we could be stuck in a bush camp somewhere and no solar energy going into the batteries, mud running outside the door. Spoke with sister Sandra this evening. She tells me in Mackay it has been raining on and off rain for the last three months. I cannot agree more. It seems since we left Airlie Beach on 19th September we have had more wet days than fine days. Not many photos this week as we have been too busy, it has been too wet and I have been too forgetful to bring the camera. We were up earlier than normal and on our way to Forest Glenn by 8am. 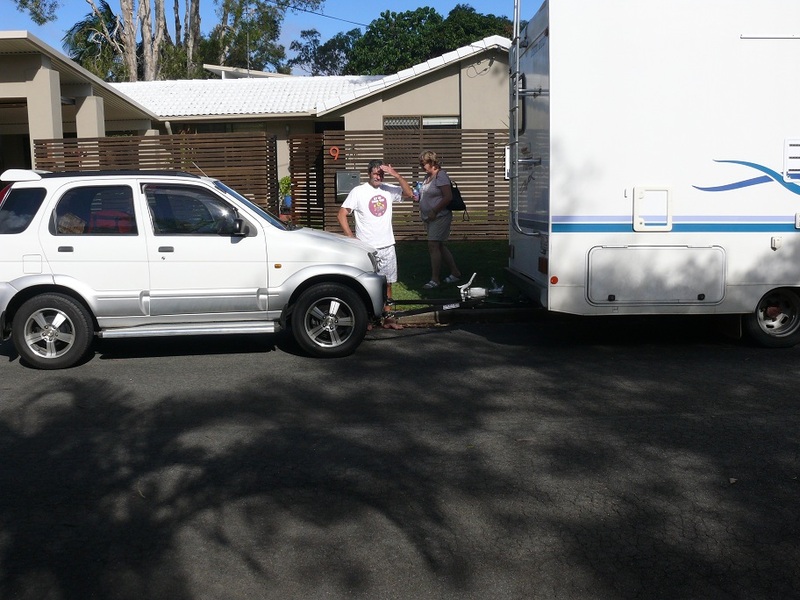 By the time we dropped both vehicles at Caravan Repairs and had a lift to the Maroochydore Sunshine Plaza it was 9.30. The manager, Glen said the job would take around 5 hours and he would call us and arrange a lift back when the job was done. Soooo. We spent those 5 hours wandering around the very large shopping centre looking like wide eyed children let loose in a lolly shop. All we bought was a protective film for the iPad touch screen. However, just looking around the shopping centre which has a river winding past and through the complex was a bit of an eye opener. The numbers of people was a bit daunting for a couple of simple country folk. At just on 5 hours we got the phone call to say all was done and a car was on its way to pick us up. Our feet were so pleased all that walking was over. Terios n WWWGO all hitched up. Closer view of the Hitch n Go. we unhitched and started the Terios to drive into the carport. I noticed the airbag warning light was illuminated. I called Glen and according to him, none of the work they perfomed was anywhere near the airbag. The pre-tensioner probably needed adjustment but they are not authorised or equipped to do that. I made a doctors appointment to renew my blood pressure prescription and to have a look at my left thumb which has been quite painful the last few weeks. Oh, by the way. The sun shone all day today. It was quite hot and humid. The sun was shining and I went for a walk along the creek for about a half hour. After a leisurely breakfast I went shopping at Bunnings, Big W, Super Cheap and BCF. By the time that adventure was over and I had coffee it was time for the doctor. The appointment was for 12.15. He wanted X-Rays of the thumb. By the time I had the X-Rays printed and back at the doctors to arrange another appointment only an hour had passed. I now have an appointment for Thursday morning. I also made an appointment for tomorrow in Maroochydore to have the Terios air bag problem checked and re-set. After lunch Ken took us to Noosa Beach to surf. First I tried the paddle ski and managed to get “out the back” behind the breakers but trying to paddle onto my first wave I fell off and in trying to get back on felt a muscle in my leg “pop”. On the next wave I fell off again and did not have the energy to get back on, particularly with the sore leg muscle. Next I tried the board. Remember I have not board surfed for over 40 years. I managed to get “out the back” and in the process of paddling for my first wave felt my rib cartilage go pop. This pop also included much pain. Although I tried a few more times I simply could not paddle without a good deal of pain. That was the end of my surfing. I must say I really enjoyed the time in the surf and the delightful sunny day was such a bonus. The pain in the chest is a downer so I guess I will be on anti-inflamatories for a week or so. Had a bad night due to the pain in my ribs. I could not move without getting a jolt of pain. I was up at 3am on the computer for an hour before getting back into bed and having a restless on off sleep until 6 am when I gave it up as a bad joke. I went to WWWGO and found my Panadene Forte as well as the anti inflamatories. Those tablets got me through the next few hours. We left at 8.30 to drive to Maroochydore to have the airbag light sorted. We drove into the service bay at exactly 9.30, our appointed time. Uh Oh. Somehow I got it mixed up and our appointment is for tomorrow and they cannot fit us in. The place is like, Robotic, with cars, mechanics and people on the move constantly. So we drove back to Noosa and managed to get a doctors appointment. Verdict? No break in the little bone beneath the base of the thumb. Somehow internal bruising is the culprit. Hmmm. I suspect the culprit is the gear shift on WWWGO. When the motor and gearbox are cold it is hard to shift into reverse gear. It involves pushing the lever all the way to the left and lift a lever and pushing forwards into gear. I suspect this is what caused the bruising three weeks ago. (I was leaving Ben Lomond and had a great deal of difficulty finding reverse gear) The rib cartilage injury has the same prognosis. Rest and anti-inflamatories. Hmmm. Once I get WWWGO moved to Traveston in a couple of days it will not be moved for a few months so the only driving will be in the Terios and the gear shift on that is user friendly. This afternoon I started some jobs on WWWGO which have been waiting for a few weeks. I placed some foam on the lightweight ladder so I can attach it to WWWGO without causing damage to the gelcoat. I also managed to insert a wall plug and liquid nails into the hole in the door where the closing magnet used to live. Perhaps with 24 hours drying time it will stay in place this time. Donnis, Sue n Ken went for a surf on Noosa Beach while I stayed at home licking my wounds. We went to Maroochydore to the Toyota dealer to have the airbag reset. After 2 hours they confessed they could not find the fault and in fact their diagnostic equipment for Daihatsu has been taken away. Their advice was to go to a well-equipped auto electrician. After that bit of annoying news we headed over to Sunshine Plaza at Maroochydore for Donnis to look at some clothes and where we could have lunch. While eating lunch we watched a storm cell build up in the distance and regular lightning and thunder displays. Mindful of possible hail I decided to sit it out for awhile especially as our car was safely undercover in the car-park. After more walking around and deciding the 40% off bargains were on an already inflated price and we did not need the items anyway decided to throw caution to the winds and drive back to Noosa. We took a roundabout route to look at some of the beaches and continued on past Noosa to Boreen Point. At the local store the owners were watching a satellite view of the storm cell. It seems golfball size hail hit Maroochydore and caused multi millions of dollars of damage. According to the shop-owners the storm was not likely to head our way so we travelled a little further around Lake Cootharaba. From the lake edge we could see the storm in the distance including the lightning. Despite the weather report at the local shop and the radio announcing a storm warning for further down the coast we decided the head back to Noosa immediately. A little way out of Tewantin the rain started. Light drops at first, becoming heavier until it was thundering down accompanied by strong winds. By the time we were half a klm from home base the roads were awash. Small branches were falling from trees. Arriving at Sue n Kens we found the power was out and stayed out for at least another 6 hours. We had phoned Ken from the lake and he had closed the windows and hatches in WWWGO ensuring there was no water inside. Regrettably the Terios developed a leak in the roof and water dripped from the overhead light fitting. Sigh. A new problem to solve. We packed up and took our leave from our wonderful gracious hosts, Sue n Ken. Thanks for your company and somewhere to park/ It was greatly appreciated. We travelled a half hour away to Traveston or Cooran where the nearest post office is situated. Although there was heavy rain last night the gravel road in was in remarkably good condition. Thank goodness, as the road is quite steep and has some tight corners. I may have driven a little fast as Donnis was following at a respectable distance. As it turned out, too respectable as she never saw me drive onto the property and drove on by. Some 5 minutes later she called on the mobile and I was able to guide her back. The property owners, Guy n Dom gave us a more detailed tour and explanation of how things work. Late in the afternoon they drove to Maroochydore Airport to meet their son arriving on a flight from Sydney. Meanwhile the predicted storm was building in the distance and sending out a few teaser rain drops to announce what was coming. Campsite beside the house with Mt.Cooran and storm buildup in the background. The storm arrived with a constant light show where the sky all around was lit up as if broad daylight. In fact mount Cooran some 1.5klms distant was clearly lit up in the night sky. 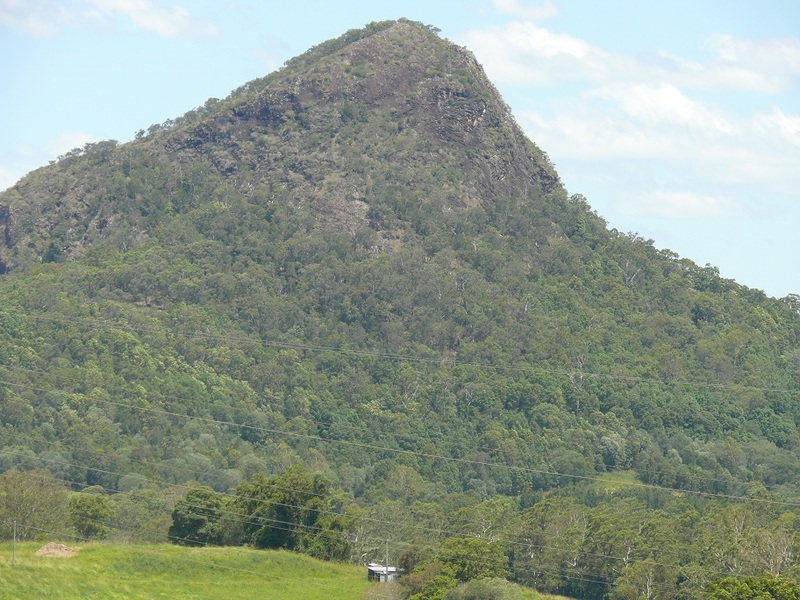 Mt.Cooran is the dominant feature in the area. We turned off all unnecessary electrical items and sat in the dark watching the spectacular show. Guy, Dom n their son Alec arrived at the height of the storm during the heaviest of the rain. In fact we could see their headlights from off in the distance, cutting a light path through the dark landscape between lightning displays. At one stage after one close strike we heard strange noises in the kitchen and found the coffee machine had turned itself on. Dom made a wonderful Vietnamese Chicken Curry for dinner and we sat around chatting until sleep crept up on us. Well, in my case, sleep caught up with me and ran past sometime around 3,30 am. Leaving me wide awake and in pain from the rib cartilage injury I received on Monday. I know it will take awhile to heal but I am not able to get comfortable for sleeping. At this time of morning it is beginning to get light and I can see a thick mist is hanging in the valley but at the moment it is too dark for a photo. The Paracetamol I took a half hour ago is beginning to kick in and I should be able to get back to bed for another hour or two of sleep. Today we had a French breakfast at a French restaurant at Cooroy. We went with the house owners and their son and met their friend Dave and his wife n son. Dave, it seems is the mister fixit I should call should I need anything auto electrical, auto mechanical or computer repairs. I deliberately did not eat anything earlier in the morning so I could have a hearty breakfast at the appointed time of 8.30. Oops! I did not know what a typical French breakfast consisted. No bacon n eggs. No toast with butter n jam. No scrambled eggs n sausage tomato. It was Capucchino with a sweet pastry such as chocolate filled croissant. It was all airy fluff and is more of a mid morning coffee break. I was hugely disappointed not to mention still hungry. I must be getting old but I really look forward to my high fibre oat bran flakes to which I add walnuts, sultanas and prunes. If I feel the need I will have a fried egg on toast or perhaps baked beans on toast. Rye of course. It was a brilliantly sunny morning along with high humidity. In fact just after lunch I fell asleep and woke in a lather of sweat. That did not last long as by about 3.30pm the electrical storm started to roll in with lots of lightning and noisy thunder. This was the third day in a row the storms have plagued us. The good side is the temperature drops. The bad side is with all that moisture, when the sun comes out, the humidity levels rise dramatically. The electric light show was not as spectacular as the night before nor was the rain as heavy. My ribs are as painful today as they have been all week. The anti-inflammatory tablets are helpful but the effects only last a few hours. The bruised thumb is also giving me curry but the brace I purchased does help. According to the doctors, rest is the cure for both ailments. Much of the heavy moving and lifting has been finished. Donnis can drive the car for the next week or so and that way my thumb will get a rest – no gear changes. No lifting, pushing or pulling should also give the ribs a rest. Any thought about buying a surfboard, at least this year have been put out of mind. Even something as innocent and fun as a Boogie Board would be painful to use for the next few weeks. I am not a good humoured guy when I live in pain. Hmmm. This location is pretty isolated with no neighbours for a few hundred metres across steep hilly and bushy ground. It is quiet except for the birds. It will be interesting to see how we both cope this week leading up to Christmas and the New Year. Also, how will I cope on my own when Donnis flies out to Canada for seven weeks!!! Tonight we ate leftovers for dinner and watched TV including Carols by Candlelight until we were too tired to watch any more. Bed beckoned. A heavy mist shrouds the nearby valley and hills. I cannot tell if it is overcast or sunny as the sky is hidden by the mist. It was sunny but that changed. Guy n Dom left before midday in a light drizzle. That also quickly changed to rain. We went to Noosa Civic for a bit of shopping then on to the movie theatre but they are closed Christmas Day. By now the rain was constant and heavier. We drove to the marina only to discover the Everglades Tour does not operate on Christmas Day. We checked out a couple of RSL and Bowling Clubs, none of which have a Christmas Lunch this year. Ooops. It seems like we will have a simple Christmas Day lunch, by ourselves, at Noosa Beach or beside the river. The weather forecast also predicts rain for Christmas Day so our options are diminishing daily. The trip back to Traveston was in very heavy rain. The area under our doorway is at least 2 inches under running water. I have stacked up the rubber mats on top of each other so we can walk into WWWGO without having to wade through water. The leak through the roof light fitting recurred. It seems regular rain is OK but heavy driving rain seems to have found a weak spot in the sun roof rubber seals. We cannot sort that out until it is dry enough to find somebody capable of doing the seals as well as somebody to solve the air bag problem. Sigh! There is always something needing attention. Hmmm! Last Sunday we woke to two inches of water at Kenilworth. This Sunday we closed the day with two inches of running water at Traveston. Although technically the property is in Traveston, Guy n Dom say they live in Cooran and Cooran Post Office is closer. The boundary line puts the property one metre into Traveston. I have not slept well the last few nights as I have pain from the torn rib cartilage and the bruised bone in my left thumb. We believe it is from the tight reverse gear change. The “sore thumb” seemed to start about the time we were at Ben Lomond when I changed into reverse gear countless times trying to get into a level position in the sloping yard. I wear a thumb brace during the day. Doctor tells me rest is the cure for both injuries. Hmmm. No pressing jobs. No appointments. No plans. Monday will be a rest day – rain permitting. It was warm and humid during the night so we put the big fan on. Eventually, after a late breakfast and morning tea we left “Willowvale” the home of Bobby n Dianne. After filling up with diesel, Donnis wanted to visit the local gem shop, Crystal Kingdom to buy a pair of earrings. Crystal Kingdom. A lot more than just crystals. After a bit of resistance from me I agreed to accompany her. I was not interested in looking through acres of earrings and other bits of semi precious stone jewellery. What caught my eye was the museum in a huge room beside the showroom. This room contained mostly material from volcanic locations in the nearby vicinity (for nearby read up to 250 klms). Much of the material was various types of “ite” as much of the material named, ended with those three characters. There were many fossils and dinosaur bones. Amazingly we were here for over an hour and unless I made a decision to drag Donnis out of there we would not have got to our next destination before dark. As it was we left Coona at 1.30 pm about three hours later than I had hoped. 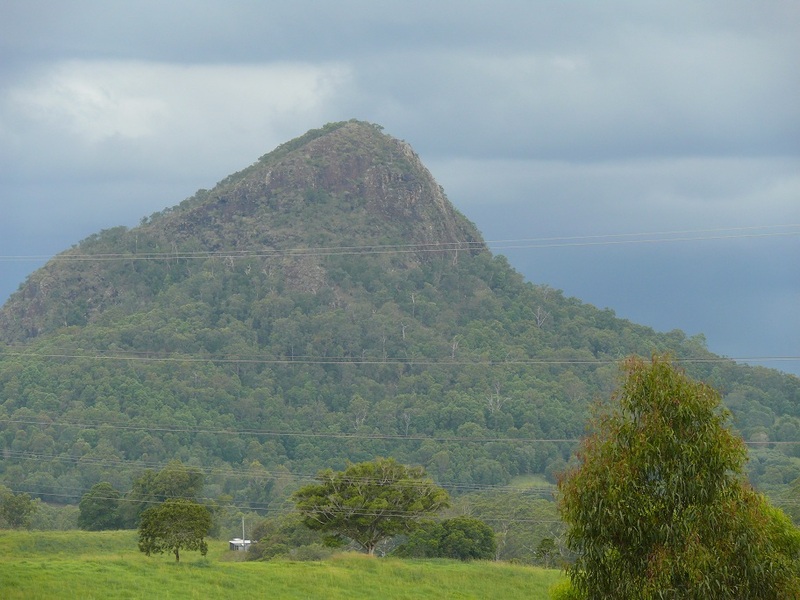 On reflection we both agree to come back to Coona in order to visit the Warrumbungle Ranges which is comprised of about 57 different volcanic plugs. Maybe we could also visit the Crystal Kingdom again to understand more about the display. On the first leg to Narrabri we saw an Emu on the side of the road. Thankfully he did not dart out in front of us. I cannot say the same for the next bird which flew in front of us. As I did not hear an impact I assumed we had missed it. Not so. We stopped for lunch at a roadside rest area and found the dead Black Faced Cuckoo Shrike behind the bull bar. I felt terrible but there was nothing I could do. We arrived at Moree and booked in to the Gwydir Caravan Park which has 5 thermal pools including a full size heated pool at about 35° with smaller pools ranging in temps up to 39°. These are the cleanest thermal pools we have encountered in our travels. Like the other pools you are asked to shower before entering. The unisex showers run continuously at a hot temperature and are open to public view. We spent an hour in the pools until we were so worn out we had to stop for dinner. This evening I witnessed a mating ritual of a pair of Crested Pigeons. The male seemed to be pecking the smaller female bird to death. After he hopped onto her and a bit off jiggling later he hopped off and strutted away. She (I’m guessing it was a she) lay hunkered down on the grass for a long time before standing up, shaking her feathers in a ruffle and also walked off. It was overcast when I woke but the sun made a welcome appearance for most of the day. The drive to Goondiwindi was interesting despite the seemingly endless flat landscape. The industry in this area is a mixture of wheat and cotton although I was surprised to see huge fields of corn. 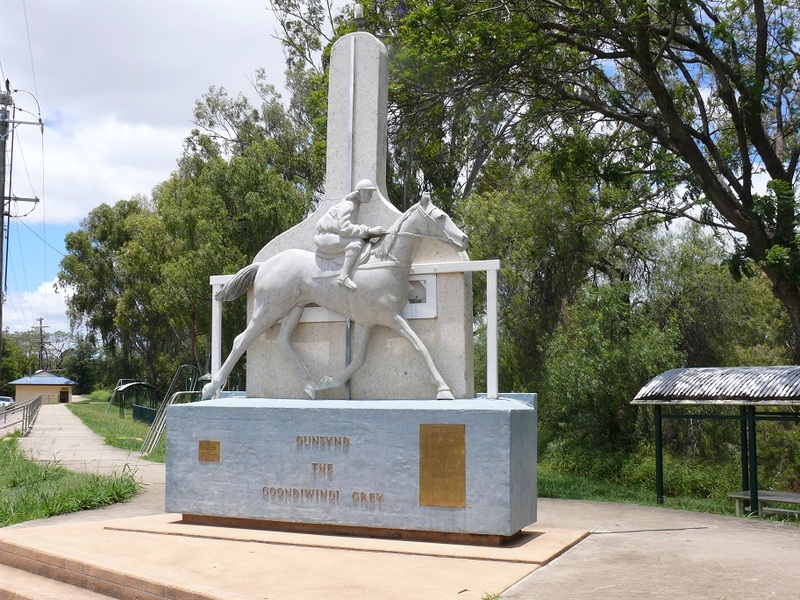 What a great little package is the town of Goondiwindi. It is neat, busy and seems prosperous although there is at least one long term business closing down. The towns leading clothing and haberdashery store was having a closing down sale with discounts of up to 70%. I was looking for a lightweight wind breaker. I did not find one but did walk out with a pair of leather sandals and a pair of Asics Cross Trainers. There are lots of very nice looking houses on very large blocks. Although many houses are old they have been well maintained and have wonderful gardens and green front lawns. We visited the Gunsynd Museum. Gunsynd was a racehorse during the late 60’s and seventies and was considered the champion horse which never won a Melbourne Cup. He did win just about every other major event on the Australian Racing calendar. Known as the Goondiwindi Grey he was popular amongst racegoers not only for a huge string of wins but for his antics in the winners circle. Now, I am not a great fan of racing but will watch the Melbourne Cup but am not interested in any other races. However, on reading the story about Gunsynd, written by a hardened racing writer I can honestly say the story brought a lump to my throat. 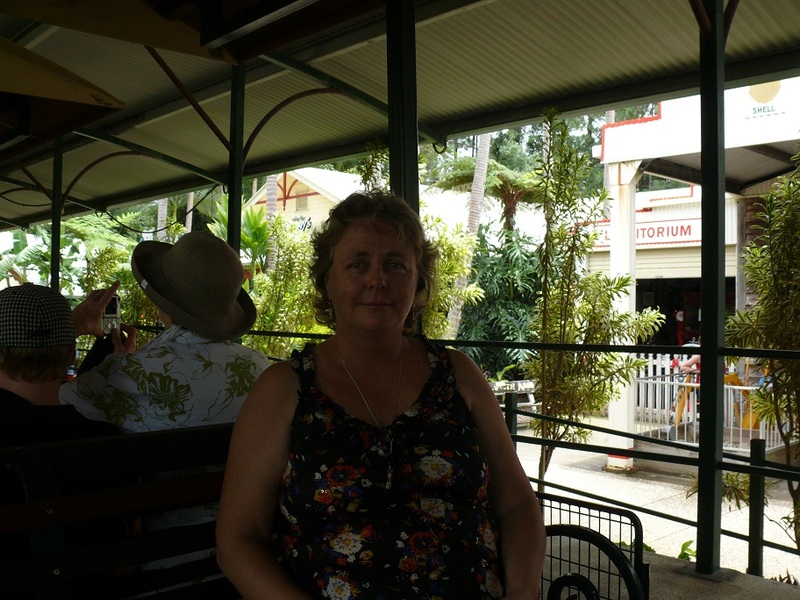 Lunch at the Goondiwindi Water Park. which is used for family picnics and water skiing facilities. This is a fabulous facility, well cared for with nice clean amenities and well maintained lawns and gardens. The barbecues and picnic shelters are a credit to the people who maintain it. We lunched there and showered before heading 17 klms out of town to a free campsite on the banks of the river. When we arrived it was a sea of mud with deep trenches where previous campers were bogged. No thanks. We turned around and moved to plan B. Oops! We did not have a plan B but made it up as we went. 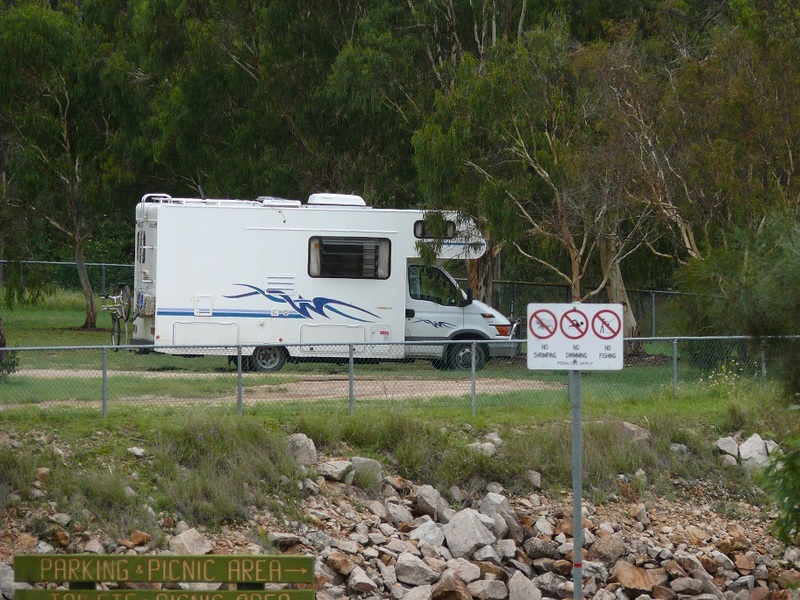 We decided not to stay at a caravan park and instead head out of town and look for a freedom campsite. The nearest was at Millmerin about 112 klms on the road to Toowoomba. So, we set off at 5.30pm on the Gore Hwy, with the sun beginning to set and arrived at Millmerin in the dark, just before 8pm. Thanks to the GPS we found the site with only minimal confusion. We had the site to ourselves. On waking this morning it was quite cool and raining. Our plans to visit local sites and lookouts were changed in an instant. No way were we risking slippery and boggy gravel roads which were already saturated with weeks of rain and more rain today and more to come this week. So… we headed off to Toowoomba to see the sights. Again, I changed my mind due to the volume of traffic in the city so we continued our trip through to Crows Nest in the mountains above Toowoomba. The A2 – New England Hwy runs out of Toowoomba but at some point becomes the Burnett Hwy and is a little confusing. 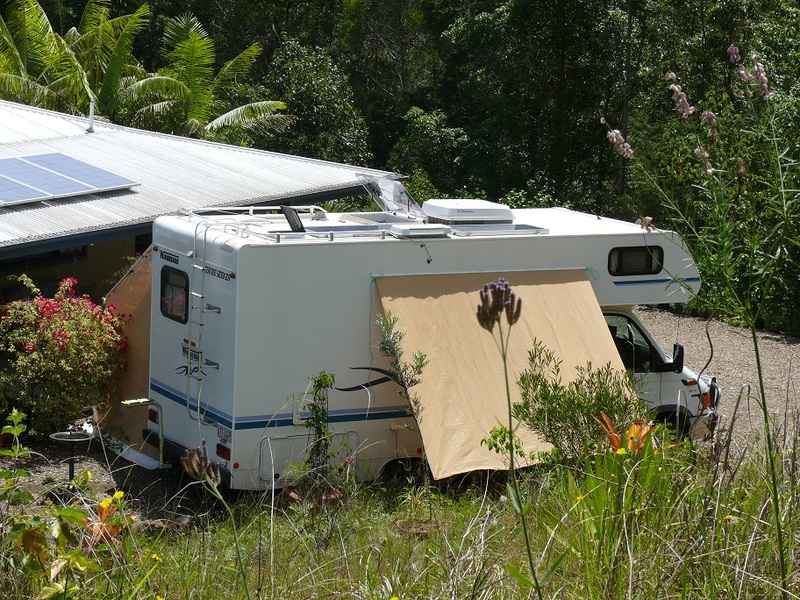 We have taken a chance with local roads and set up camp at Crows Nest National park. Our lonely campsite at Crows Nest National Park. We are the only campers here and night has fallen with a thud plus all the other myriad of night-time noises. but were too tired to continue on the longer trail to the lookout above a waterfall. Perhaps in the cool of tomorrow morning. The bushy bearded one in a a bush setting at Crows Nest National Park. Light rain fell overnight and I woke to overcast conditions although the sun makes an appearance occasionally. 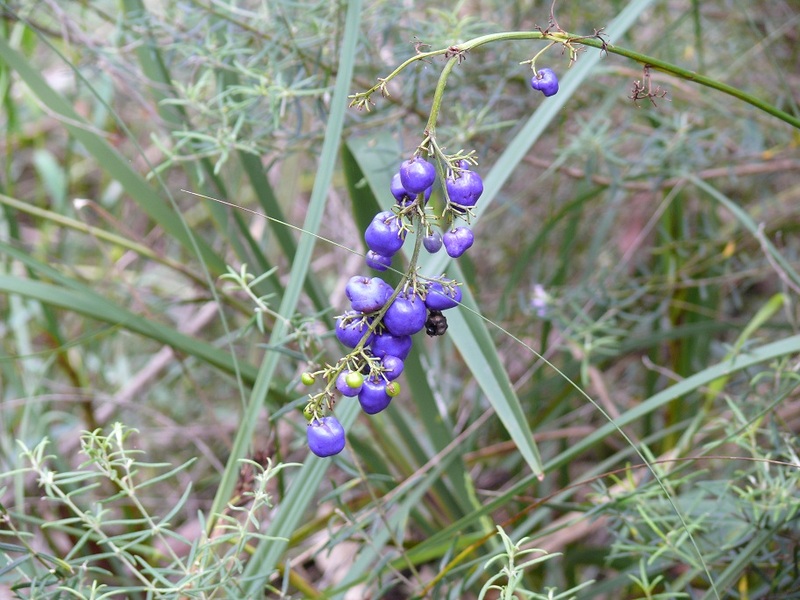 We found many nushes with these berries growing on them. Can anybody identify these berries? 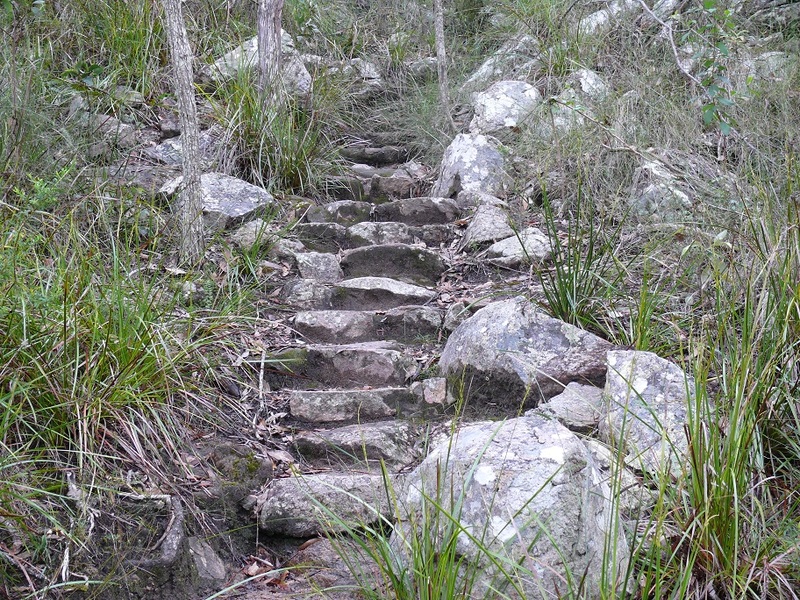 This morning I was reading a blog where the people were on a bushwalk and the lead walker stepped over a snake without seeing it while the second walker shouted, snake. I quickly put that out my mind while we had breakfast then started our own bushwalk to the lookout above the waterfall. Ten minutes into our walk we encountered a snake. 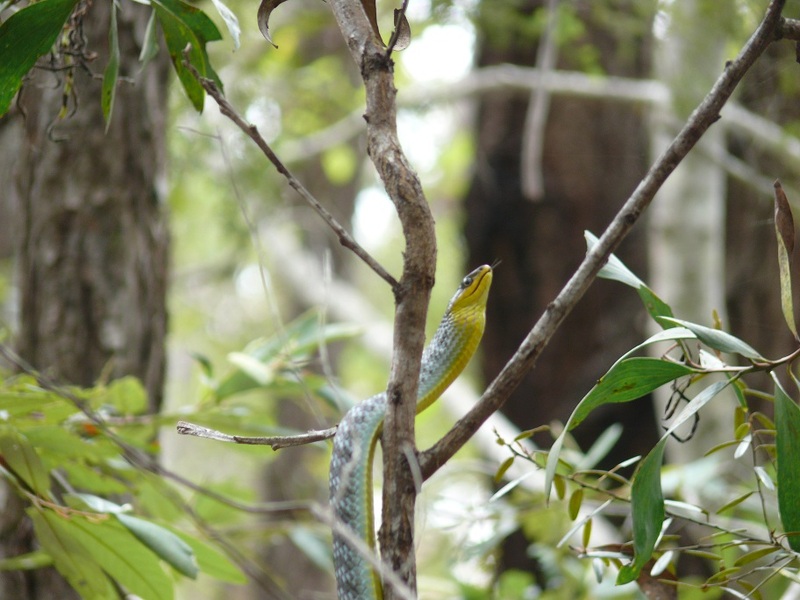 Fortunately it was a Green Tree Snake about a metre long. I thinks he got as much fright as I did because he took off quickly into the scrub. Too quick for me to even think about taking a photo let alone getting the camera ready. Still talking about seeing a snake we almost stepped on another. This one was not so easy to identify and I did not like the look of its markings. Added to that the snake went into its offensive attack posture, that is, curving the head and body into an S shape and raising the head off the ground while flattening the neck area, sort of like a Cobra. Its forked tongue was quivering and it was not going anywhere, standing it’s ground. We stood quietly waiting. Once I handed my walking pole to Donnis so I could hold the camera, it reacted with more aggressive behaviour before heading off the track. Trying to photograph a snake on the move is not easy. Especially when it starts climbing a tree and the lens cannot differentiate between a branch and the snake attached to it. Common Tree Snake. It seems to be grinning at us. 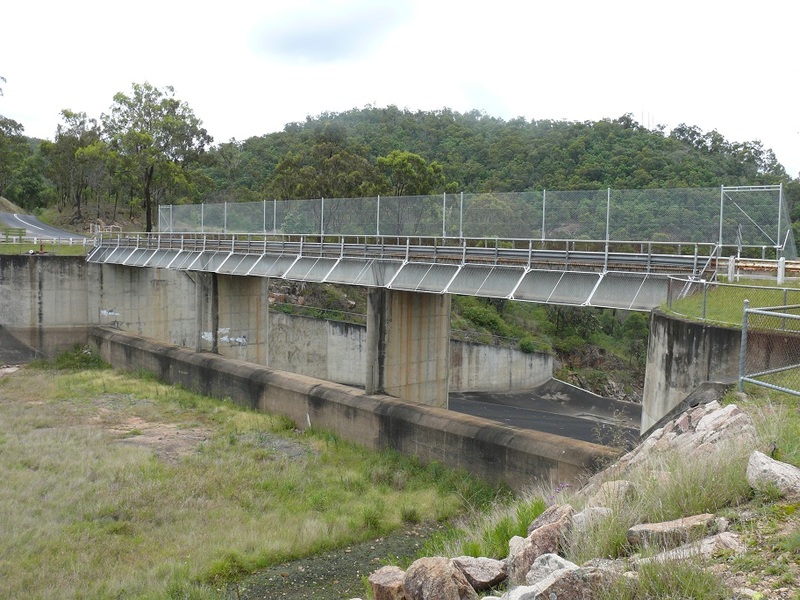 Perseverance Dam the water supply for Toowoomba. Seems to be awefully low considering the amount of rain which has fallen in recent months. the main water supply for Toowoomba, Highfield and Crows Nest. Lunch spot at perseverance Dam. 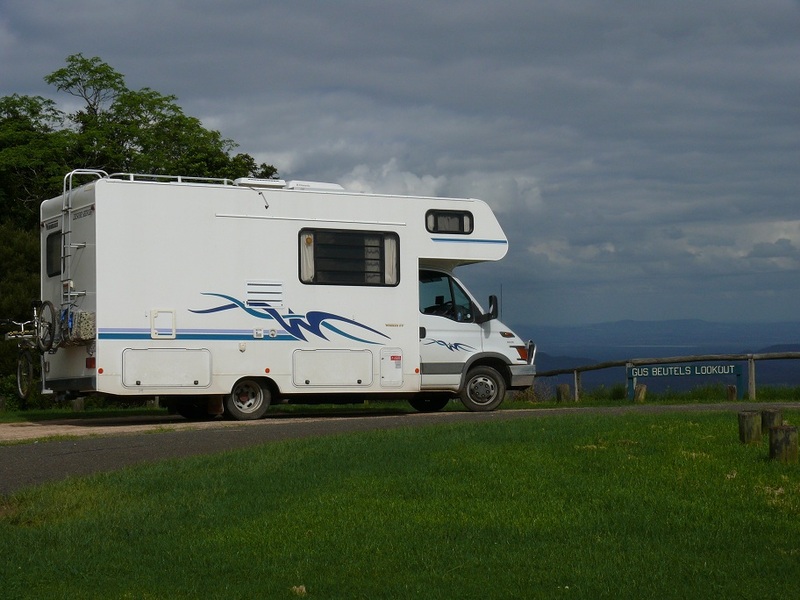 After a scrumptious lunch (our own prepared lunches are usually scrumptious) overlooking the lake – which seems to be about 50% full – we headed off to look at a freedom campsite at Ravensbourne and Gus Buetells Lookout. Gus Buetells Lookout near Hampton Qld. One was not suitable and the other does not permit camping. From there we dropped into the village of Hampton where another campsite was available but being right on the highway we decided to move on to Cooyar about 50 klms up the New England Highway. See I told you it was confusing. Where did the Burnett go??? Yes you are correct. Cooyar is where we overnighted two weeks ago at the site of the 5 year olds grave. This time around we hooked up to power for $5 but there is no water as all the town is on tank water. We are low on water so it will be sponge baths tonight. We did think about a pub dinner last night but wanted to use up the leftovers of cabbage, dahl and carrots to go with some smoked haddock and fresh asparagus. Mmmm. Asparagus cooked in the same milk as the haddock is delicious. 6.40am the sun is streaming through the dinette window but only for a short while. There was an opening in the otherwise overcast sky. On the bedroom side the sky is as black as black. Then the wind began. Hmmm! Better get my early morning walk completed before any rain begins. As I was returning a few fat drops of rain landed on my face. Another delightful day of rain will annoy me. Donnis loves this weather. Not too hot and not cold. Funny thing, we are about 300m off the highway and unless trucks use their exhaust brakes we cannot hear any traffic noise. We are in sight of a repeater station yet cannot get any signal on either mobile, the iPad or the Wireless Modem. We are only 50 klms from where we camped on Wednesday night where we were “in the bush” but had perfect reception but no TV (except a very week analogue signal). Here we have no mobile reception but perfect digital TV. Go figure. It was quite warm n humid last night so while Donnis watched perfect digital TV I turned on the AC for an hour as I uploaded photos from the camera and edited some in preparation for the blog. A liitle after 9am we left Cooyar and drove through several towns including Kilcoy where an old army mate, Noel, lives. Regrettably we have not been able to contact him for several days so we continued down the mountain and turned back up the mountain for Maleny. Along the way we stopped at a lookout to view the Glasshouse Mountains with Brisbane way in the background. 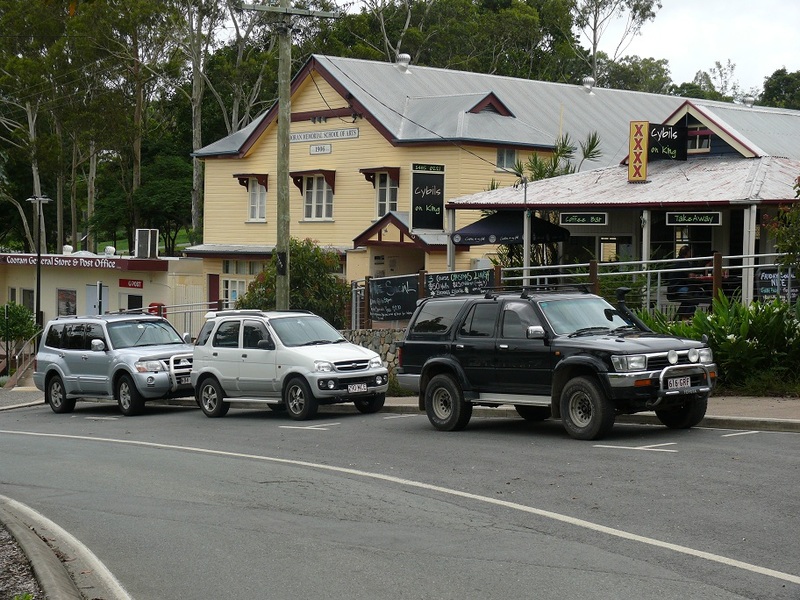 Maleny itself was in turmoil as main roads are laying fresh asphalt in the main street and traffic was backed up in all directions. Add school buses and parents collecting kids from schools and tourist buses and you get the picture. We stopped to have a look at an over 50’s resort where you can buy the house but not the land but there are no rates, no taxes, no body corp, no legal fees, no exit fees and you keep any capital gains. Rent is $134 per week. Only an hour to Noosa. Only a bit more to Brisbane. 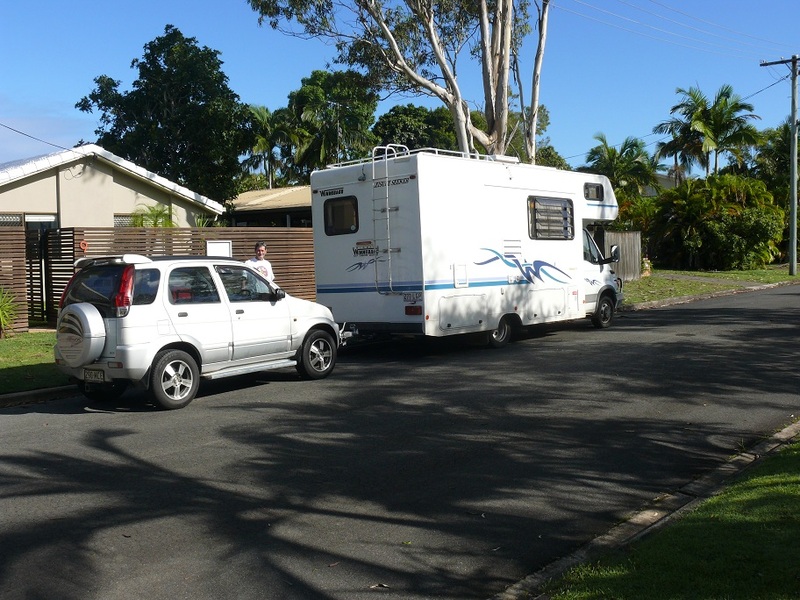 We arrived in Kenilworth and drove into the Showgrounds and met the CMCA Chapter South Burnett Travellers with whom we will spend the weekend. Our site at Kenilwort Showgrounds before the torrential rain began later in the afternoon. We had dinner at the local pub and it was surprisingly good. Prices were OK but wine prices were on the high side. All in all it was a good meal. We walked to and from the pub. It was hot n humid overnight and I put the AC on for a few hours. Last night we watched a movie called Evolution on the laptop. It was a silly movie along the lines of Ghost Busters, only this time it was aliens from outer space and there was lots of slimy yukky stuff. The really good part of the movie was the soundtrack. We have a speaker system purchased for use with one of the iPods but it does double duty as a sound system for the laptop. It is like a surround sound theatre system. Today dawned early for me at 4.45am but stayed in bed until around 5.30 as a number of birds outside the window were fighting over a grub one had found. The sky told me it would be one of those days where the weather itself does not know what it will do. By mid morning it was blue skies and stinking hot n humid. We had a Christmas lunch of cold meats, salads and prawns. Of course we had a glass or two of wine and a fun mystery santa. 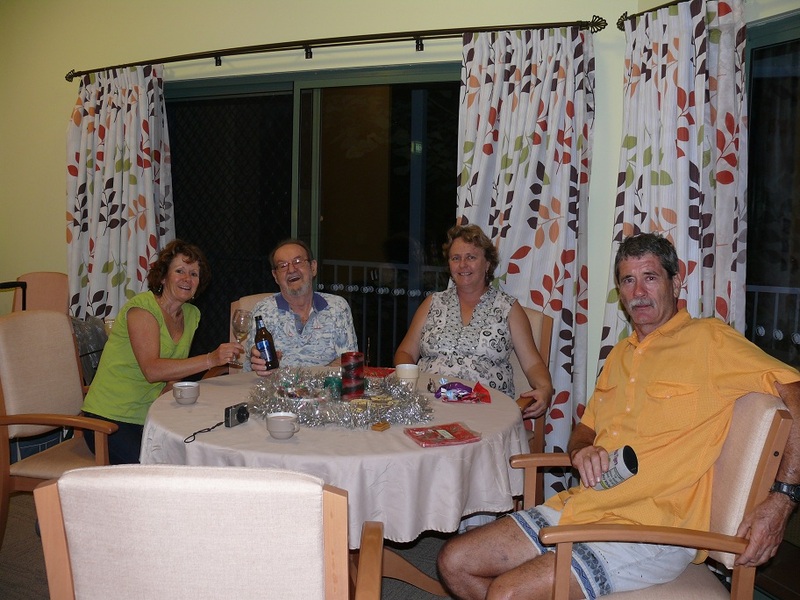 We enjoyed meeting many of the South Burnett Travellers some of whom we have met before when they visited the Sugarloafers. 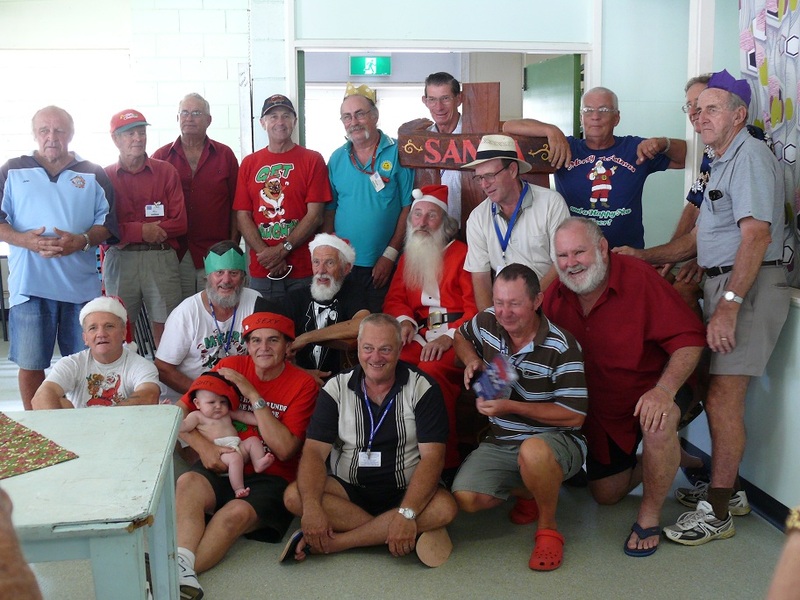 The men of South Burnett Travellers meet Santa. After lunch Donnis n I watched another movie, a long one called Defiance. I will not explain it here but will say it is based on a true story, has a loud sountrack and I stayed awake all the way through. Midway a threatening storm hit with heavy rain and strong winds so after packing all the outside stuff in a heap to stay almost dry / almost saturated we returned to the movie. By then it was dark so we sloshed through puddles to the hall for a dinner of leftovers and Donnis has been invited to play cards. You only have to ask her once. Went to bed to the sound of constant rain. It is 4.20am and I am wide awake listening to the rain. I woke several times during the night and heard constant rain. I type this entry until I am tired enough to go back to bed. Hmmm! We have to get out of here later this morning and already the water is 50cm deep above the grass. I still have to disconnect the power, empty the black water and grey water at the dump point. All the rubber mats have to be put away as does the table and chairs. All wet of course. Maybe the sun will come out during the week so everything can be dried and aired. A drawback about living in a motorhome is there is limited space to put wet shoes, umbrellas and rain jackets when it is raining. At the moment it is just rain so some stuff under the awning will not be too bad. When strong winds arrive as well, nothing escapes getting wet. The rain continued to fall steadily as we packed up. One by one we watched the other rigs leave until there was just one other couple and ourselves. Donnis packed up inside while I worked outside in the unrelenting rain. Eventually we were ready so Donnis drove WWWGO to the dump point where I emptied the grey water and toilet cassette. By now I was thoroughly wet via the air vents in the rain jacket leaking water and the bottom my shorts soaking up the rain as it ran off the lower edge of the rain jacket. Duhh! Too late, I remembered the rain pants I keep in the hatch for days like this. Was I glad that Donnis had stayed inside and had a towel and dry clothes waiting for me. It rained for the rest of the afternoon and the evening, finally stopping about 8pm. Even when we arrived at Noosaville the rain continued meaning we could move minimal stuff out of WWWGO for our 4 day stay. Tomorrow the forecast is for showers. Tomorrow we get the Hitch n Go installed. The sun has not yet risen above the nearby hills so we are still in shadow and it is a little chilly. However the birds are chirping and the sky looks blue. Maybe, just maybe it will be a nice sunny day with few clouds and NO wind. As things turned out the day was quite warm when the sun was not behind a cloud and you were out of the wind. While Linda went to work and Alecia and Gavin went to school, Greg and Justin took us for a tour of Ben Lomond then on to a tour of Guyra. We had coffee at a place called JoJo’s which is a combination coffee shop, (Justin has been there so many times he makes the coffee ) curiosity shop, clothes shop and soaps and trinkets and toys and so on. What makes this place even more interesting is it is run by an eccentric (his words) man called Colin. He is an ex Barrister who still dabbles in the local law scene but apart from the coffee shop also owns a garage and panel beating shop as well as a school bus run in which he drives the bus. He also takes his products such as goats milk soap and Angora socks and plastic shoes with a washable inner woolen sock, ideal for cool winter evenings. He also does the cooking at his shop with including his specialty, chicken vegetable curry. Even more amazing about Colin is he has a collection of cycles which have won or placed in some world cycling event stretching back over 40 years. The bikes are all stacked up in a room at the back of the coffee shop. People seek him out via phone, email or the internet to buy one of these historical bikes. Some are made out of carbon fibre and are so light to lift. The weight is measured in sub kilo. The lighter the bike, the heavier the price tag. Most bikes were in the $7,000 price range while many were worth more than $20,000. There was, according to Colin, more than half a million dollars of cycles in that room alone. 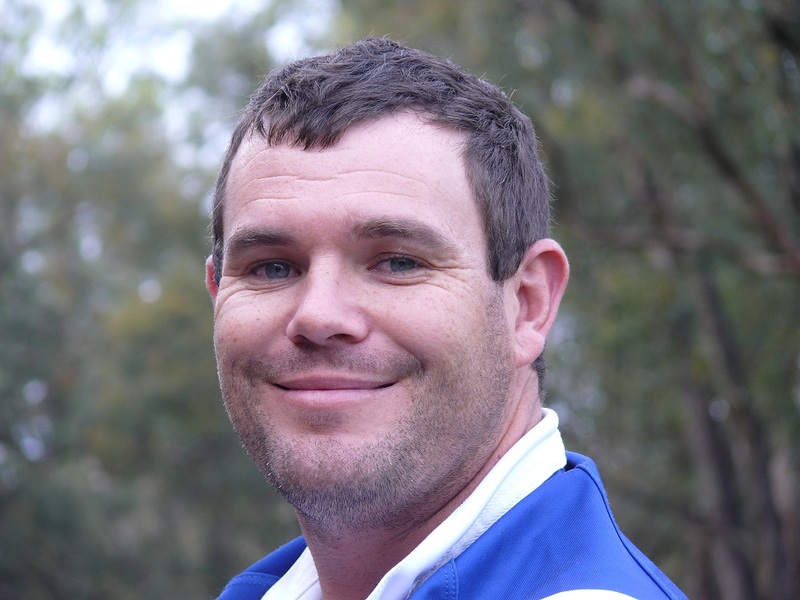 Colin stopped practicing law full time around 12 years ago and came to Guyra about three years ago. According to him, his story is that he became too involved in a large case and took on more than he needed to. Eventually he tried to commit suicide by walking in front of a bus. The driver was quick to react and succeeded in knocking Colin to the ground and under the chassis but no life threatening injuries. Later when distracted and again with suicidal thoughts accidentally walked in front of a bus and was knocked down again. By a strange twist of fate it was the same bus driver. When he recovered Colin apologised to the driver and looked to fulfill his life in other ways and gave up full time law. Frank Greg n Justion waiting outside the hospital for Linda to finish work. Tonight we cooked up a batch of cutlets with lentils in the pressure cooker. There was enough for everybody, including seconds. Woke at 6.30am. Yeah! There was heavy overcast and a very chill strong wind was blowing. Good thing much of the day will be spent travelling and we will be snug in the driving cabin. We stopped at Armidale for fuel, groceries and black and grey water dumping and taking on fresh water. Armidale has an automated toilet. It is a unisex toilet and it is all stainless steel and tiles. The door is closed and if it is empty a green light is flashing so by the push of a button it will open. The light is red if occupied. On entering a voice welcomes you and gives instructions its use. A time limit of 10 minutes is allowed. The toilet will not flush until you wash your hands or open the door to leave. Even the hand wash, the water and hand dryer are all automated by placing your hands under the appropriate lights. It also automatically cleans the toilet and floor at certain times of the day. Amazingly there is no graffiti and no damage. We travelled along the New England Hwy as far as Tamworth, Country Music Capitol of Australia. 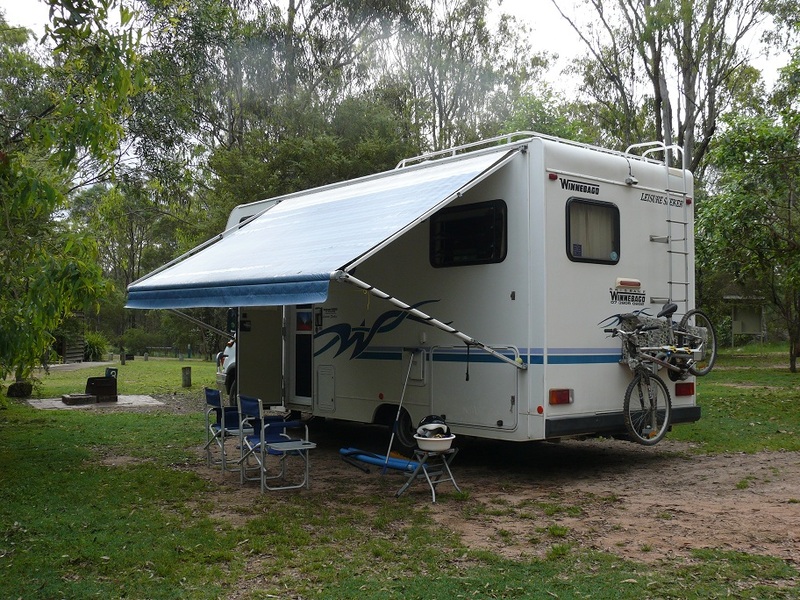 Our original plan was to stop for the night at Bendemeer but we could not find the camping area so we continued to Moonbi but the camp site was right on the highway in the centre of town. 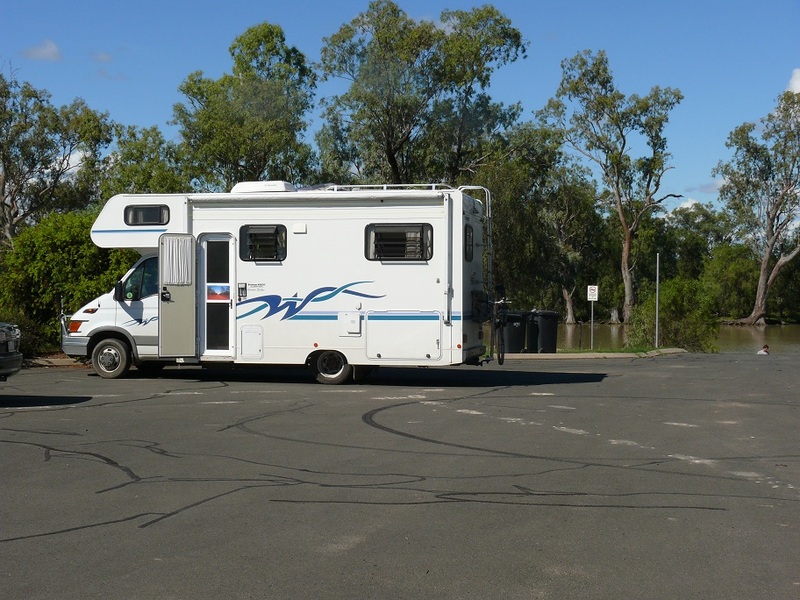 We then tried to find a riverside campspot at Kootingal and gave up and drove on into Tamworth and finally, after much searching, found a campsite on the highway across from the airport. By now we were too tired to care. After dinner we heard three Air Force jets take off and boy do they make a noise and a vibration. By 9.30pm all flights had finished and road traffic was thin so we hoped to get a good nights sleep. Woke at 6.30am. So much for worrying about traffic noise. 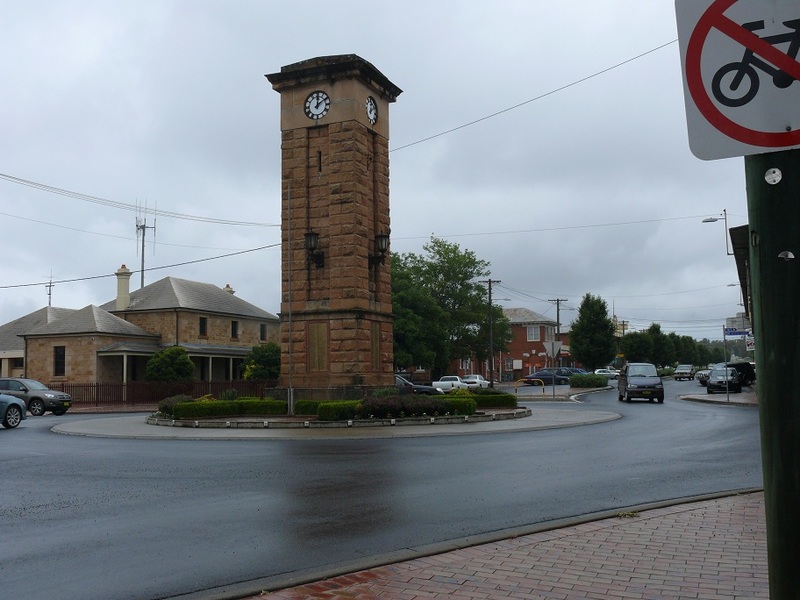 Today we drove along the Oxley Hwy in increasing rain to Coonabarabran. Clock Tower at the centre of Connabarabran. Along the way we were stopped in heaving rain by a Rural Fire Brigade man in the middle of the Hwy. There was an accident around the corner and the car was being recovered. We could proceed with caution. The rain continued and most creeks were in flood or rising. The Castlereagh River at Coonabarabran is also rising but we were able to cross as the water was not yet over the road. Bobby n Dianne live a couple of minutes out of town in a private wooded area. Bobby has a huge rifle collection as well as having a secure storage strongroom and safe for guns handed in to the Police as he has better secure storage than they do. I also learned he was once the Australian Masters Shooting Team coach. Tomorrow we visit a chicken farm and catch up with my 90 year old aunt. Went for a walk to the Castlereagh River – about 200 metres through the long grass or 600 metres via the road, I took the long way – the river is still in flood but the height has dropped since yesterday. Both weirs are underwater and traffic is not allowed through. The wide loads trucks are lined up outside town waiting for the water levels to reduce so they can continue their travels. The Police will not allow the vehicles to pass through town. It rained most of the night and floods went through Coonamble last night. That floodwater will reach here later today or tonight. We went out to visit the chook farm to pick up a few eggs. A few eggs? Something like a box of eggs containing 6 trays and 15 eggs per tray. After all, the family is coming for an early Christmas gathering and we are invited. Because it was still raining we never got out of the car at the chook farm. Besides, the stench was overpowering. Next we visited Aunt Maude, Bob’s mother. 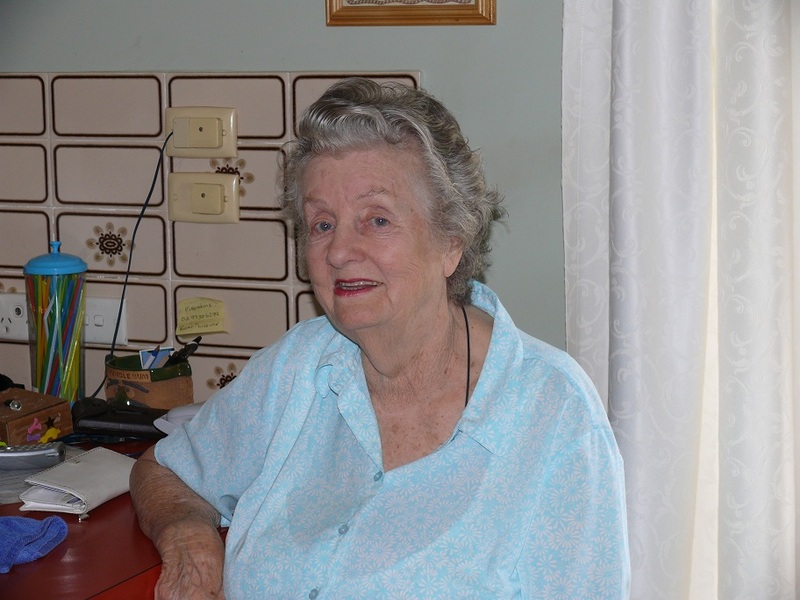 Have not seen her for at least 10 years and not visited her at Coonabarabran for at least 50 years. She looks frail but still strong in the mind. She turns 90 next year. We also dropped into the local grainery / fertiliser place. All the trucks and silo’s are sitting idle. The harvest is delayed due to the rain. A crop valued at M$350 is sitting in the fields and unless it is harvested in the next few days is only worth M$100 or less as stock feed. If the rain continues there will be no harvest. Grant. Bobby n Dianne son. and his wife Bec and their two young children arrived. They live at Moranbah not far from Mackay. After a bit of talk we found that Bec used to work with CGU Insurance and regularly dealt with the staff at the office of Oceanic Insurance Brokers. After a barbecue dinner Donnis discovered Bec works with a programme called Snapfish and Bec likes preparing photo albums which she then has printed. I must admit they do look good. Before going to bed we set up an account at Snapfish. The day dawned heavily overcast but no overnight rain. The river level has gone done but is still across the road near the house. Grant’s car had broken down on the way from Moranbah. The repairs, completed under warranty, meant the car was now ready to be picked up. 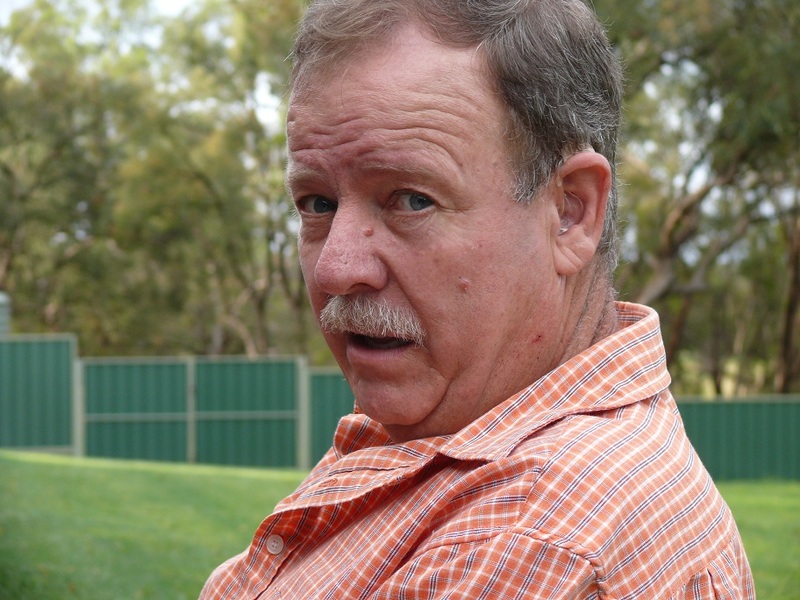 Bob, Grant and I drove the hire car – also provided under warranty – over to Gunnedah and picked up Grants car. Before leaving Gunnedah we drove out to look at Lake Keepit where Bob has kept a caravan and annexe, on-site, for thirty years. It started to rain on our return and some creeks were in flood again. Shortly after arriving back at Coona (BTW it was still dry here) Bob n Dianne daughter Libby and her husband Gary and their 4 children arrived. Paige n Isobelle academically and sports gifted daughters of Libby. While dinner was being prepared it was somehow agreed that us men, the hunters, would hunt for some rabbit for a barbecue tomorrow. Where there was fields of rabbit yesterday there were none today. On our second pass of the field we got a call from Bob’s brother, Lance. 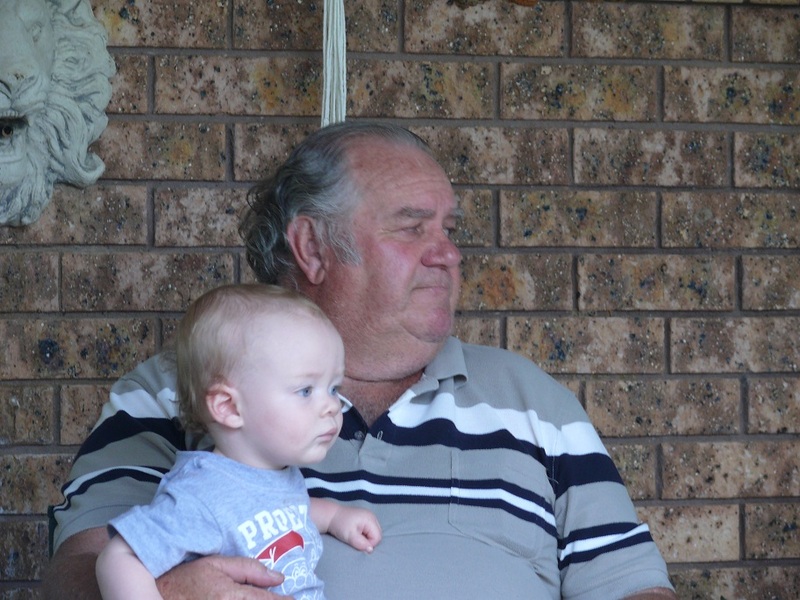 He had gone through a flooded causeway on his way here and the car was flooded with some major motor damage and the car was being towed to Gilgandra. He and his wife needed a lift so Bob n I were despatched to Gilgandra to fetch them. Before we left we saw news reports of flooding in Dubbo, Orange, Wellington, Mudgee and other places. Many roads were closed and trucks were delayed or stopped as they could not move. Although the drive to “Gillie” was dry, the rain started just as we came over the bridge. Hmmm. Lots of water rushing below us. The river is the Castlereagh which also runs through “Coona”. We had driven almost 100 klms to collect the stranded couple and their luggage. It was fully dark by the time we left “Gillie” and the rain had increased and was so heavy we had trouble seeing and speed was down to 30 kph. Four pairs of eyes were straining to see out the windscreen and there was no conversation. By the time we dropped Lance n Jane at Maude’s it was after 10pm and we were tired and hungry. By now the rain had well and truly set in and it was a good night to rug up and stay in bed. I woke a few times to the sound of rain. Time for a bit of a rant. Talking with Bob and other rural people it seems if your dog or dogs escape from your property and menace or kill other persons livestock, justice is swift without argument. Once a dog has a taste of fresh blood he will never be the same and must be put down. Either to owner of the dead stock will put the dog down or the dog owner will do it himself. There are no if buts or maybe’s. The dog owner will pay the stock owner suitable compensation. That is the unwritten rule in the bush. Now let’s swiftly move to an urban situation. A dog or dogs escape and attack a person in the street or on their own property. In cases like this the dog owner will deny his precious dog is dangerous and will resist all efforts to put the dog down. Meanwhile the injured party is likely to spend days, weeks or months in hospital or worse, dies. Forever more they will be terrified of dogs. There is no compensation for the injured party. It seems to me the rural people live up to their responsibilities as a dog owner whereas urban people will not. Woke at 6am. It was still raining, quite heavily at times. Forecast is for more n more n more rain. Basically sat around home, eating n drinking n socialising most of the day. Rain showers on n off most of the day. We borrowed Bob’s Land Cruiser and drove into town for a look around. Back home we continued the eatin n drinkin n socialisin. Late in the day Aunt Maude arrived with Bob’s brother Lance, his wife Jane and their son Wade who happens to be a forensic cleaner at Waratah Police Station near Newcastle. (The elimination of bloodstains, stains sustained from other bodily fluids, offensive odours biohazardous material & finger print powder.) Lance tore a tendon in his leg while trying to push his car out of a flooded creek yesterday. So we settled down for another barbecue with all the trimmings and a few drinks. The children all got presents and the noise of their squealed delight was deafening. Dianne gave us a basket of bathroom goodies, Thank you Dianne. It was an unexpected surprise. Today has been mostly fine and the sun even poked through a few clouds during the day. The flood scene continues further south with Wagga Wagga now the latest scene of inundation and homeowners are being evacuated. 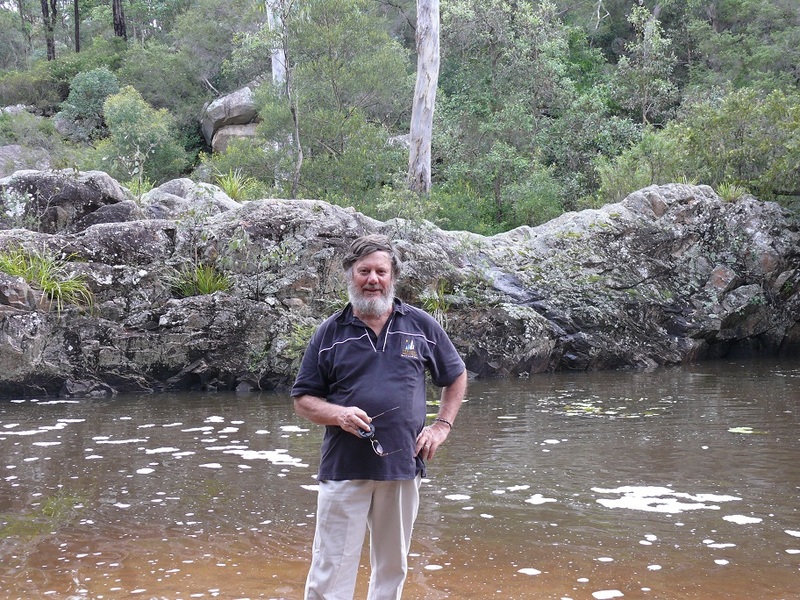 Here in Coonabarabran I dug a small pit to dispose of black water. Although we are quite some height above the Castlereagh River and on a hill, I discovered the water table a short distance below the surface. After digging less than 300mm water started oozing into the hole, quickly filling it. The more I dug the bigger the hole grew as water swirled around. It seems the ground is so waterlogged we are walking on a thin crust of soil and sand suspended over the water. According to Bob all this area along the river is soft sand and mixed with water can soon form the old fashioned scary movie stuff known as quicksand! Yep. After digging around in the stuff I can agree with him. 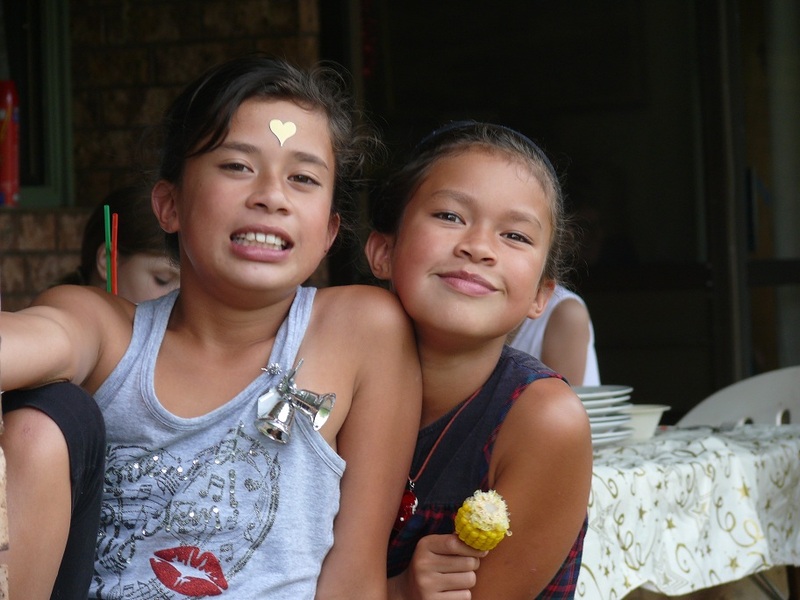 Today Libby, Garry and their 4 children, Paige, Isobelle, Tahlia and Felicity left to return home to Newcastle. 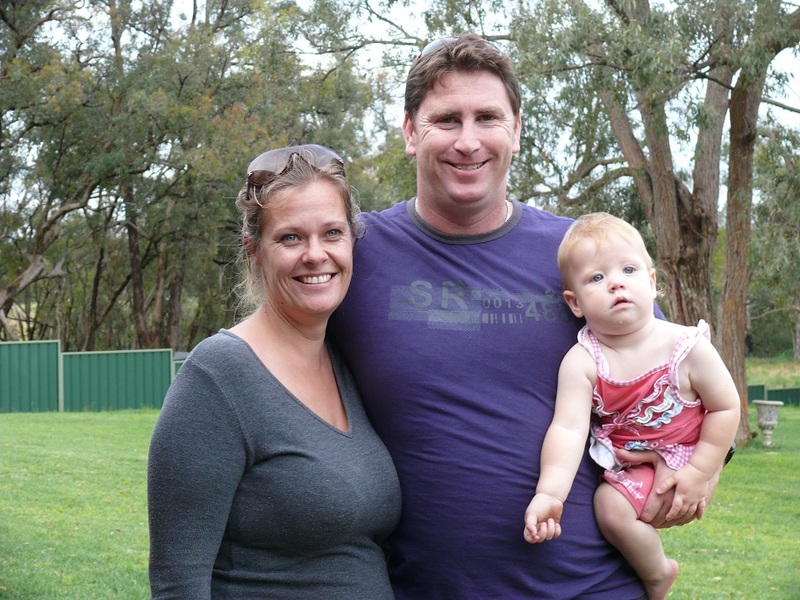 Tomorrow Grant, Bec and their two children, Mia and Bailey will head home to Moranbah while we set sail with Moree as our destination. Further if we feel the need. I had taken the bike off the back of WWWGO when we first arrived but with the rain I could not go for a ride. Today was dry enough so I rode into town and took a look at a park on the riverbank. Hmmm! Disappointing there is no cycle path in town and through the park and under the bridge. After the park I battled traffic to the clock tower then rode home and put the bike back on the rack.